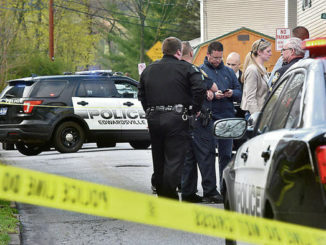 DALLAS TWP. 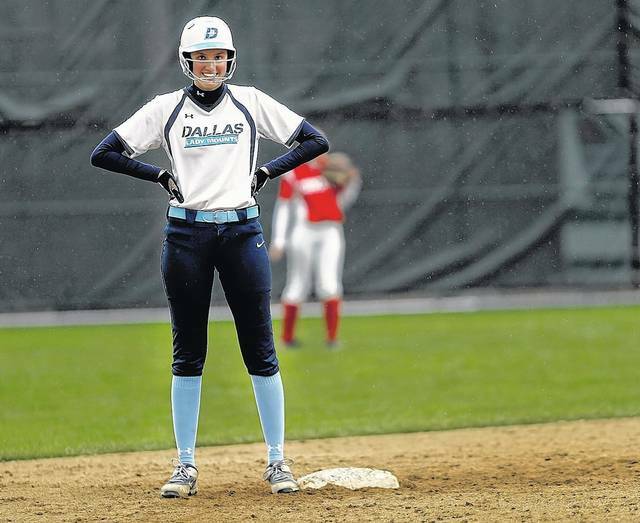 — Every game counts now towards the District 2 softball playoffs. Some games a little more than others. Like on Tuesday, when Dallas played Crestwood with both teams at the fringe of the D2-4A playoff field. 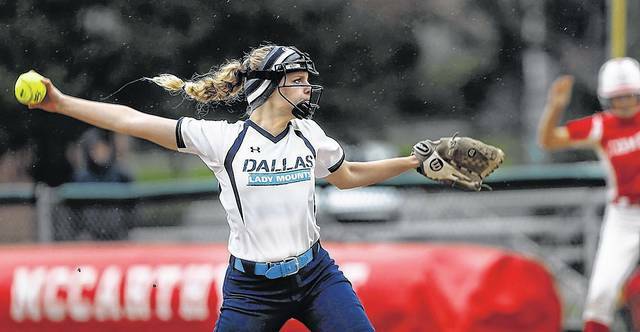 Dallas took the upper hand as the Mountaineers used the one-hit pitching of Sydney Hornlein and a four-RBI performance from Samantha Kern to defeat Crestwood 7-0 in a Wyoming Valley Conference interdivisional game. Dallas improved to 3-2 in Division 2 and 3-5 overall with the victory played in a light but steady rain and temperatures in the mid-50s. Crestwood fell to 2-3 in Division 1 and 2-6 overall. Dallas entered the game eighth in the D2-4A standings. Crestwood was ninth. Only the top eight teams are locked into districts. Other teams can qualify with a winning record, but based on recent history it’s unlikely the field expands beyond eight teams. Hornlein and Crestwood starter Jalyn Cook were in a pitchers’ duel through three innings before Dallas broke through with two runs in the fourth. Kern led off the fourth with a double to right and scored on a bunt single by Hornlein after Hornlein got caught in a rundown between first and second bases. Lilly Lombardo followed with a single and scored on a double by Kaci Hockenberry into the left-center gap. Dallas had just one hit — a single to center by Lombardo in the second — though the first three innings. The aggression carried over to the fifth, where Dallas built its lead to 6-0. Christina Schappert was hit by a pitch to open the inning. Gianna Spaciano and Mia Dixon followed with bunt singles and Kern cleared the bases with a double to left. Kern later scored on an error. The 6-0 advantage was more than enough the way Hornlein was pitching. She retired the first nine batters she faced before hitting Haley Naperkowski with a pitch to start the fourth. Brooke Aton led off the sixth with a single to left for the Comets’ only hit. The Black Knights took control with a six-run fifth inning to defeat visiting Meyers. Savannah Purdy knocked in three runs and Corinna Scoblick and Emily Smith had two RBI each for Lehman (3-3 Div. 3, 4-6). Krista Scoblick pitched a complete game. Emma Barker tripled in three runs for Meyers (1-5 Div. 3, 1-6) in the sixth inning. Ashley Bruno and Alexis Semanek had two hits each. Tunkhannock rallied from a 6-2 deficit to defeat Wyoming Area and remain atop Division 2. Hailey Farr was 3-for-4 with a triple, double and four RBI for Tunkhannock (4-1 Div. 2, 5-4). Makayla Quick added two RBI. Kendra Schultz struck out 15. Nicole Silinskie knocked with three runs and doubled for Wyoming Area (2-3 Div. 2, 4-5). Kari Melberger had two RBI and Bri Pizzano had a double and single. Chloe Sromovski threw a no-hitter and GAR scored 12 times in the third inning to end the game by the 15-run rule. Sromovski and Erin Leonard led GAR (1-4 Div. 3, 4-5) with three RBI each. MMI fell to 1-3 in Division 3 and 3-3 overall. Berwick rallied with five runs in the bottom of the seventh to keep Nanticoke Area winless. 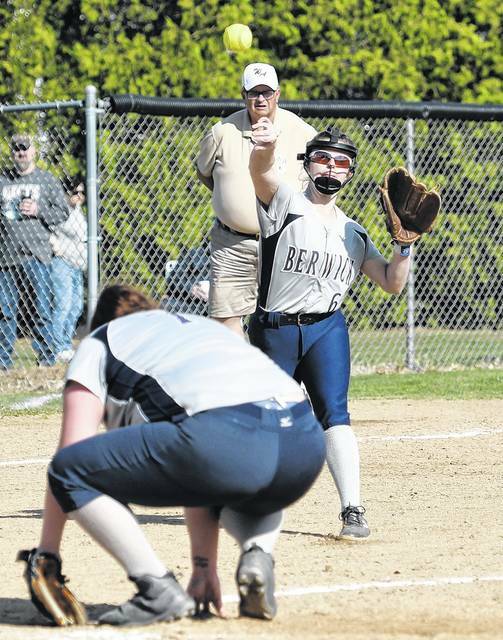 Katie Starr was 2-for-4 with a homer and three RBI to lead Berwick (3-2 Div. 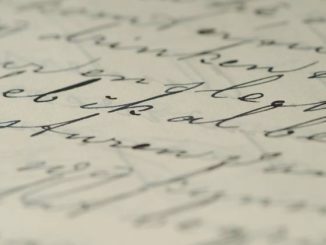 2, 4-2). Kelsey Caladie doubled and had an RBI. Rachael Shaftoe had a single and two RBI. Allison Keener homered and Jen Kurkowski had two hits for Nanticoke Area (0-5 Div. 2, 0-10). 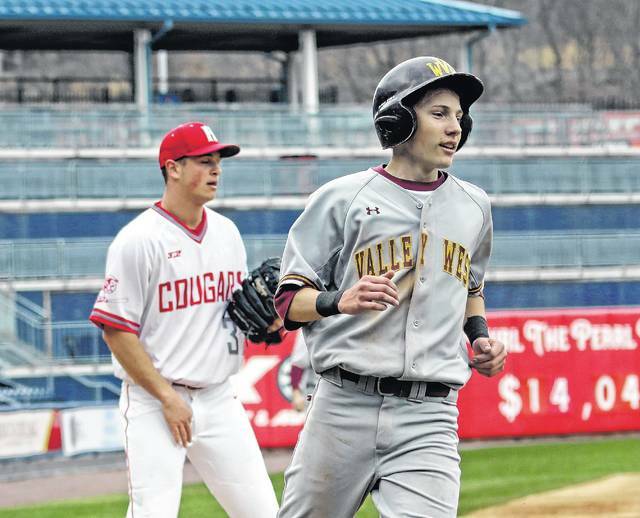 The Cougars jumped on Wyoming Valley West early, scoring two runs in the first inning. Julia Mrochko and Julia Mooney each drove in two runs and scored once for the Cougars (4-0 Div. 1, 8-0). Mrochko finished the game 2-for-5 with a triple. Mooney finished 1-for-3 with a triple and a walk. Julia Franks went 1-for-2 with a double to lead the Spartans (2-3 Div. 1, 3-3). Tori Para held the Coughlin lineup to one run on one hit through five innings for Pittston Area (4-0 Div. 1, 8-0). Bailey Loyack went 3-for-4 with a home run to lead the Pittston Area offense. Lexi Felinski also went 3-for-4 with two triples and four RBI. Alex McHugh added a home run for the Patriots. Stacy Balent went 1-for-2 with a double and an RBI for Coughlin (0-5 Div. 1, 1-8). Top Hitters: MEY, Ashley Bruno 2-4, RBI, run; Lael Walker 2B; Alexis Semanek 2-4; Emma Barker 1-1, 3B, 3 RBI, run. LL, Krista Scoblick 2-4, run; Corinna Scoblick 1-4, 2 RBI, 2 runs; Hailey Evans 1-2, RBI, 2 runs; Emily Smith 1-2, 2 RBI, run; Savannah Purdy 2-3, 3 RBI; Jess Spencer 1-2 2 runs. Pitching: MEY, Abbi Sattof (L) 6 IP, 12 H, 11 R, 8 ER, 3 BB, 1 SO; LL, K.Scoblick (W) 7 IP, 8 H, 5 Rm 4 ER, 2 BB, 4 SO. Top Hitters: WA, Bri Pizzano 2-4, 2B, RBI, 2 runs; Kari Melberger 1-4, 2 RBI, run; Nicole Silinskie 2-4, 2B, 3 RBI; Stephanie Nowak 1-2, 2 runs. TUN, Faith Jones 1-3, 2 runs; Kendra Schultz 2-4, 2B, RBI, run; Jena Simmons 1-2, 2 runs; Hailey Farr 3-4, 2B, 3B, 4 RBI, run; Makayla Quick 1-3, 2 RBI. Pitching: WA, Jess Skladzien (L) 6 IP, 9 H, 7 R, 7 ER, 8 BB, 3 SO. TUN, K.Schultz (W) 7 IP, 8 H, 6 R, 5 ER, 2 BB, 15 SO. Top Hitters: GAR, Oliva Prato 1-3, 2B, 2 runs; Erin Leonard 1-3, 2B, 3 RBI, 2 runs; Chloe Sromovski 3-3, 3B, 3 RBI, 3 runs; Skylar Elmy 3 runs; Espinal 1-2, 2B, 2 RBI, 2 runs; Sabrina Nunez 1-3, 2 RBI; Kelis Quiller 2-2, RBI, 2 runs. Pitching: MMI, Alexis Dalessandro (L) 3 IP, 11 H, 15 R, 11 ER, 6 BB, 0 SO; GAR, Sromovski 3 IP, 0 H, 0 R, 0 ER, 2 BB, 3 SO. Top Hitters: BER, Peyton Lipsey 1-4, run; Katie Starr 2-4, HR, 3 RBI; Emma Stoker 1-3; Kelsey Caladie 2-3, 2B, RBI; Rachael Shaftoe 1-2, 2 RBI, NAN, Jen Kurkowski 2-4; Allison Kemmer 1-3, HR; Jenna Baron 1-3; Liz Redenski 1-3, 2B; Olivia Nice 1-3, run. Pitching: WP, Emily Novicki. LP, Brinley Sobeck. Hitting — HA, Julia Mrochko 2-5, 3B, 1 run, 2 RBI; Julia Mooney 1-3, 3B, 1 run, 2 RBI. WVW, Julia Franks 1-2, 1 2B. Pitching — HA, Caitlyn Katchur 7 IP, 3 H, 0 R, 0 ER, 3 BB, 3 SO. WVW, Sara Hoskins 7 IP, 9 H, 9 R, 5 ER, 3 BB, 6 SO. Hitting — PA, Alexa McHugh 1-4, HR; Bailey Loyak 3-4, HR, 2B; Lexi Felinski 3-4, 4 RBI, (2) 3B. COU Stacy Ealent 1-2 2B, 1 RBI. Pitching — PA, Tori Para 5 IP, 1 H, 1 R, 1 ER, 2 BB, 4 SO. COU, Jordan Pugh 5 IP, 15 H, 19 R, 17 ER, 3 BB, 3 SO. Samantha Kern stands on second base smiling after she drove in three runs in the fifth inning Tuesday against Crestwood. Dallas shortstop Christina Schappert tags out Crestwood’s Brooke Aton trying to steal second base in the sixth inning Tuesday. Dallas starting pitcher Sydney Hornlein threw a complete-game one-hitter against Crestwood on Tuesday. Crestwood’s Cameron O’Neill slides into second base as Dallas second baseman Lily Lombardo of Dallas waits for the ball Tuesday. Dallas’ Lily Lombardo slides into third ahead of the throw to Crestwood third baseman Madyson Sobolewski in the fourth inning Tuesday. Holy Redeemer’s Adam Mahler added two more medals to his collection, winning a pair of bronzes at states. 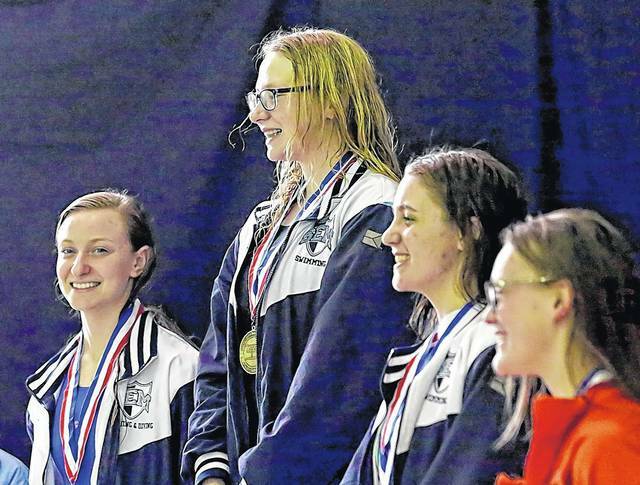 Wyoming Seminary’s Skylar Roerig earned four at the PIAA meet, including a bronze of her own on a relay team. 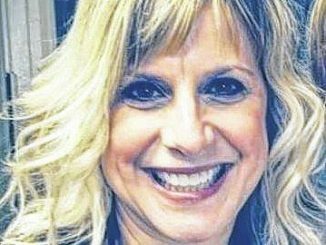 Those performances earned them MVP awards in Class 2A, as chosen by Wyoming Valley Conference swimming coaches. Joining them as MVPs in Class 3A were Hazleton Area’s Marina O’Hara and Paul Flowers. Diving MVP honors went to Dallas’ Jaelyn Shaver and Meyers’ Jose Rivera in Class 2A and Wyoming Valley West’s Sophia Ginocchetti and Connor Rosencrans in Class 3A. All eight MVPs were determined by using top performances during the season. WVC coaches also voted on Coach of the Year awards, choosing Dallas’ Romayne Mosier (2A) and Hazleton Area’s Michelle Yakubowski (3A). First-team all-stars for each event were given to the No. 1 relay team and the No. 1 and No. 2 individual finishers with honorable mentions going to No. 2 relay teams and No. 3 individual finishers using district results. First team: WS (Skylar Roerig, Madi Federici, Aviah Dahlgren, Kylee Kolbicka), 1:47.66. Honorable mention: HR (Emily Mahler, Margaret Walting, Julia Bucknavage, Caitlyn Blaum), 1:48.25. First team: DAL, Melissa Leonard, 1:55.88; BER, Sydney Lloyd, 1:58.00. Honorable mention: WS, Aviah Dahlgren, 1:59.84. First team: DAL, Emma Thomas, 2:15.96; WS, Saskia Papsova, 2:16.10. Honorable mention: HR, Julia Bucknavage, 2:16.84. First team: HR, Margaret Walting, 24.48; DAL, Gabby Spaciano, 25.00. Honorable mention: WS, Noam Wasik, 25.16. First team: DAL, Jaelyn Shaver, 404.20; DAL, Mia Reinert, 351.1. Honorable mention: HR, Mary Strunk, 311.15. First team: WS, Kylee Kolbicka, 57.81; HR, Julia Bucknavage, 59.01. Honorable mention: BER, Sydney Lloyd, 59.93. First team: WS, Skylar Roerig, 52.34; WS, Kylee Kolbicka, 53.13. 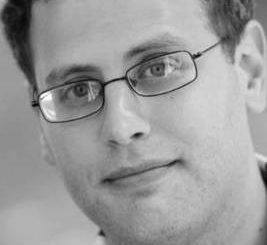 Honorable mention: WS, Noam Wasik, 54.73. First team: DAL, Melissa Leonard, 5:12.57; WS, Aviah Dahlgren, 5:19.87. Honorable mention: DAL, Emma Thomas, 5:21.62. First team: DAL (Gabby Spaciano, Gabby Krochta, Gina Kerrick, Melissa Leonard), 1:40.77. Honorable mention: WS (Noam Wasik, Madi Federici, Saskia Papsova, Paige Jackett), 1:41.49. First team: WS, Skylar Roerig, 57.95; HR, Emily Mahler, 1:01.03. Honorable mention: DAL, Gabby Spaciano, 1:01.98. First team: HR, Margaret Walting, 1:04.21; HR, Caitlyn Blaum, 1:07.97. Honorable mention: WS, Madi Federici. First team: WS (Kylee Kolbicka, Noam Wasik, Aviah Dahlgren, Skylar Roerig), 3:34.47. Honorable mention: HR (Margaret Walting, Julia Bucknavage, Emily Mahler, Caitlyn Blaum), 3:38.33. First team: TUN (Davis Tidball, Dyllan Henning, Dylan Mislevy, Julien Madus), 1:42.96. Honorable mention: DAL, Jason Puza, Dennis Dukinas, Zach Bloskus, Shane Szczecinski), 1:44.28. First team: HR, Adam Mahler, 1:42.14; DAL, Shane Szczecinski, 1:44.84. Honorable mention: DAL, Kevin Allen, 1:54.42. First team: TUN, Davis Tidball, 22.59; WS, Nansen Wang, 22.71. Honorable mention: TUN, Dyllan Henning, 23.38. First team: MEY, Jose Rivera, 275.75; TUN, Hunter Snay, 264.85. First team: HR, Adam Mahler, 49.18; TUN, Dylan Mislevy, 56.97. Honorable mention: DAL, Zach Blockus, 57.64. First team: DAL, Shane Szczecinski, 48.49; TUN, Davis Tidball, 49.79. 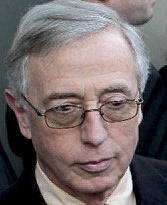 Honorable mention: HR, Chris Schell, 51.23. First team: WS, Nathan Tindell, 5:11.57; DAL, Jack Stout, 5:12.70. Honorable mention: HR, Adam Smith, 5:12.75. First team: TUN (Davis Tidball, Julien Madus, Dylan Mislevy, Dyllan Henning), 132.10. Honorable mention: HR (Adam Mahler, Adam Smith, Chris Schell, Mike Williams), 132.92. First team: LL, Logan Kuhar, 57.80; TUN, Dylan Mislevy, 59.34. Honorable mention: DAL, Jason Puza, 100.32. First team: DAL, Dennis Dukinas, 1:01.46; TUN, Dyllan Henning, 1:03.64. Honorable mention: BER, Colin Hill, 1:08.99. First team: HR (Adam Mahler, Adam Smith, Mike Williams, Chris Schell), 3:23.38. Honorable mention: DAL (Shane Szczecinski, Zach Blockus, JR Redmond, Dennis Dukinas), 3:23.57. First team: HAZ (Maggie Yannes, Alissa Platukis, Haley Sanko, Sarah Lloyd), 2:00.82. Honorable mention: NAN (Julia Fritz, Kaleigh Klein, Deanna Wadzin, Caitlin Lehman), 2:05.63. First team: HAZ, Bridget Reed, 2:05.97; HAZ, Abigail Goulstone, 2:06.82. Honorable mention: HAZ, Maggie Yannes, 2:07.91. First team: HAZ, Haley Sanko, 2:26.26; HAZ, Alissa Platukis, 2:32.12. Honorable mention: NAN, Kaleigh Klein, 2:39.75. First team: HAZ, Sadie Hunsinger, 26.83; HAZ, Sarah Lloyd, 27.25. Honorable mention: NAN, Caitlin Lehman, 27.35. First team: WVW, Sophia Ginochetti, 482.75; PA, Libby Williams, 338.90. First team: HAZ, Bridget Reed, 1:05.10; NAN, Deanna Wadzin. Honorable mention: PA, Olivia Norwillo, 1:09.72. First team: HAZ, Marina O’Hara, 55.39; HAZ, Sadie Hunsinger, 58.53. Honorable mention: HAZ, Sarah Lloyd, 59.02. First team: HAZ, Maggie Yannes, 5:36.04; HAZ, Abigail Goulstone, 5:41.92. Honorable mention: WVW, Sydney Bruno-Beck, 5:53.32. First team: HAZ (Bridget Reed, Sadie Hunsinger, Abigail Goulstone, Marina O’Hara), 1:45.02. Honorable mention: HAZ (Kaitlyn Connors, Olivia Norwillo, Kiersten Grieco, Ella Hoban), 1:51.87. First team: HAZ, Marina O’Hara, 1:03.53; HAZ, Stefany Malaga, 1:09.18. Honorable mention: NAN, Julia Fritz, 1:14.75. First team: HAZ, Alissa Platukis, 1:14.22; HAZ, Haley Sanko, 1:15.95. Honorable mention: PA, Kacie Fisk, 1:24.98. First team: HAZ (Bridget Reed, Haley Sanko, Sadie Hunsinger, Marina O’Hara), 3:50.02. Honorable mention: HAZ (Caitlin Lehman, Kaleigh Klein, Emma George, Deanna Wadzin), 4:07.71. First team: HAZ (Anthony Goulstone, Paul Flowers, Ryan Kovalick, Brandon DaGrosa), 1:40.83. Honorable mention: NAN (Julian Homa, Christopher Cabonilas, Christian Mavus, Michael Marcella), 2:05.63. First team: HAZ, Antonio Daiute, 1:52.87; HAZ, Brandon DaGrosa, 1:56.22. Honorable mention: NAN, Julian Homa, 2:02.31. First team: HAZ, Anthony Goulstone, 1:57.33; HAZ, Ryan Kovalick, 2:08.63. Honorable mention: Cody Manherz, 2:21.87. First team: NAN, Michael Marcella, 25.01; WVW, Jared Zawatski, 25.22. Honorable mention: PA, Zack Gregory, 25.89. First team: WVW, Conner Rosencrans, 241.00; WVW, Trevor Ultsh, 235.95. First team: HAZ, Paul Flowers, 52.52; NAN, Christopher Cabonilas, 56.85. Honorable mention: NAN, Christian Mavus, 1:03.12. First team: HAZ, Thomas Pollock, 53.05; NAN, Michael Marcella, 55.32. Honorable mention: PA, Zack Gregor, 57.34. First team: HAZ, Ryan Kovalick, 4:52.64; HAZ, Antonio Daiute, 5:01.21. Honorable mention: NAN, Hugo Panecat, 5:42.42. First team: HAZ (Anthony Goulstone, Brandon DaGrosa, Antonio Daiute, Paul Flowers), 1:31.04. Honorable mention: NAN (Michael Marcella, Christian Cabonilas, Christian Mavus, Julian Homa), 1:37.81. First team: HAZ, Anthony Goulstone, 54.83; WVW, Jared Zawatski, 1:00.60. Honorable mention: HAZ, Brandon DaGrosa. First team: HAZ, Paul Flowers, 58.11; NAN, Christopher Cabonilas, 1:01.55. Honorable mention: Thomas Pollock, 1:07.10. First team: HAZ (Thomas Pollock, Cody Manherz, Antonio Daiute, Ryan Kovalick), 3:30.71. Honorable mention: NAN (Christian Mavus, Hugo Panecatl, Joseph Reyes, Jeffrey DeRocco), 3:58.64. Wyoming Seminary’s Skylar Roerig (center), Kylee Kolbicka (left) and Noam Wasik (second from right) took the top three spots on the podium in the 100 free at districts, earning them all-star honors from WVC coaches. HAZLE TWP. 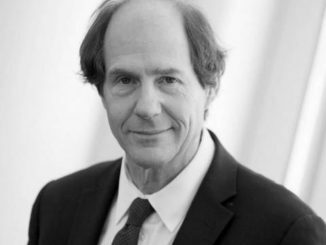 — Control of first place will have to wait a few days. 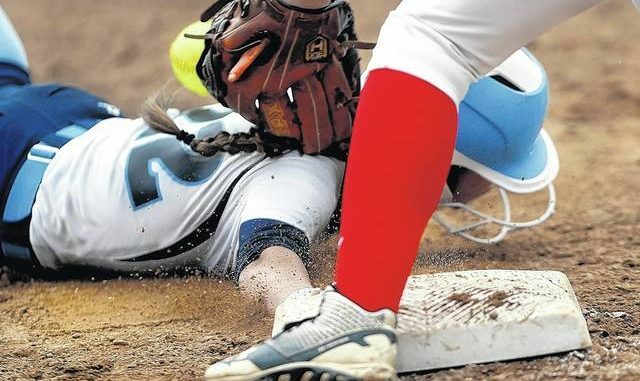 The showdown between Pittston Area and Hazleton Area started Friday, but a relentless wind-blown rain suspended the Wyoming Valley Conference Division 1 softball game in the third inning. Hazleton Area led 3-1 with no outs in the bottom of the third. 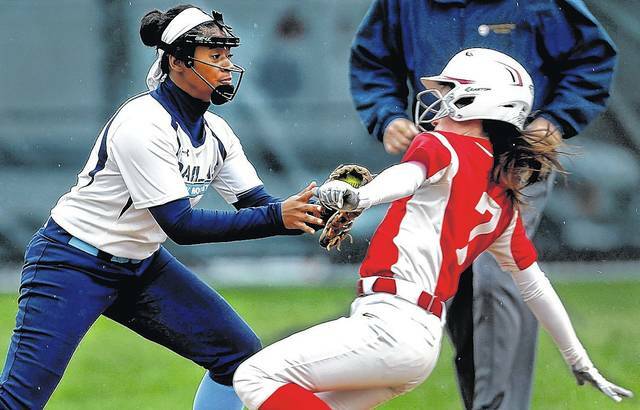 The game will be picked up at that point — with Hazleton Area’s Tiana Treon in the batter’s box with an 2-0 count — most likely on Monday. Both teams have non-conference games on Saturday and Sunday’s weather looks shaky. Pittston Area and Hazleton Area are both 3-0 in WVC Division 1. Both teams are unbeaten overall, with Pittston Area 6-0 and Hazleton Area 5-0. The only other unbeaten team in District 2 is the Lackawanna League’s Abington Heights (5-0). The umpires halted the game after Pittston Area pitcher Alexa McHugh launched a wild pitch to the backstop. The rain wasn’t hard, but the wind was blowing it directly in the faces of the fielders. It was also becoming more evident that neither pitcher could get a solid grip on the softball. The plan was to wait 30 minutes and reevaluate the situation. The sky, though, remained a gloomy gray and it was obvious the rain wasn’t going to halt. Surprisingly, the field held up quite well. Hazleton Area took a 1-0 lead in the bottom of the first when lead-off hitter Julia Mrochko launched a home run to left field. Pittston Area tie the score 1-1 in the second on a line-drive homer to right by Shayla Williams. Mrochko led off the third with a double to left and Aleah Kost followed with a walk. Kost immediately broke for second and the throw sailed into center field, allowing both players to score for a 3-1 Hazleton Area lead. The Cougars had three hits against McHugh, who allowed just 22 hits in 34 innings entering the game. Hope Jones was 4-for-4 and scored twice as Tunkhannock defeated Nanticoke Area in a Division 2 game. Hailey Farr was 2-for-4 with an RBI. Kendra Schultz was 2-for-4 and was the winning pitcher. She fanned 11. Olivia Nice doubled and knocked in both runs for Nanticoke Area. Katie Starr and Emma Stoker hit home runs and Rachel Shaftoe added two RBI as Berwick posted a road victory. Stoker also had two RBI. She pitched a complete game with seven strikeouts. Meyers’ Abbi Sattof threw a no-hitter, striking out nine. She was 3-for-5 at the plate with a team-high five RBI. Ashley Bruno, Dakota Zyskowski and Lyssa Rhodes all had two RBI. 2B: Mrochko. HR: Williams, Mrochko. Top Hittters: TUN, Hope Jones, 4-4, 2B, RBI, 2 runs; Kendra Schultz 2-4; Faith Jones 1-4, RBI, run; Jena Simmons 1-3, RBI, run; Hailey Farr 2-4, RBI; Gina Walsh 1-4, RBI; Makayla Quick 1-4, run; Erin Dunn 1-3, 2B, run. NA, Jen Kurkowski 1-3; Alison Keener 1-2, run; Olivia Nice, 1-3, 2B, 2 RBI. Pitching: TUN, Schultz (W) 7 IP, 4 H, 2 R, 2 ER, 1 BB, 11 SO. Top Hitters: BER, Katie Starr 3-3, HR, 3 runs; Sarah Dent 2-3, 2B, RBI; Emily Novicki 3-4, 2B; Emma Stoker 2-3, HR, 2 RBI; Kelsey Caladie 1-2; Rachel Shaftoe 2-4, 2 RBI. COU, Ashley Tomeo 1-2; Jordan Pugh 1-2; Zi Xuan Wang 1-1. Pitching: WP: Stoker. LP: Pugh. Top Hitters: MEY, Ashley Bruno 4-5, 2 RBI; Dakota Zyskowski 2-4, 2 RBI; Lyssa Rhodes 3-4, 2 RBI. Pitching: WP: Sattoff. LP: Sara Youkoski. 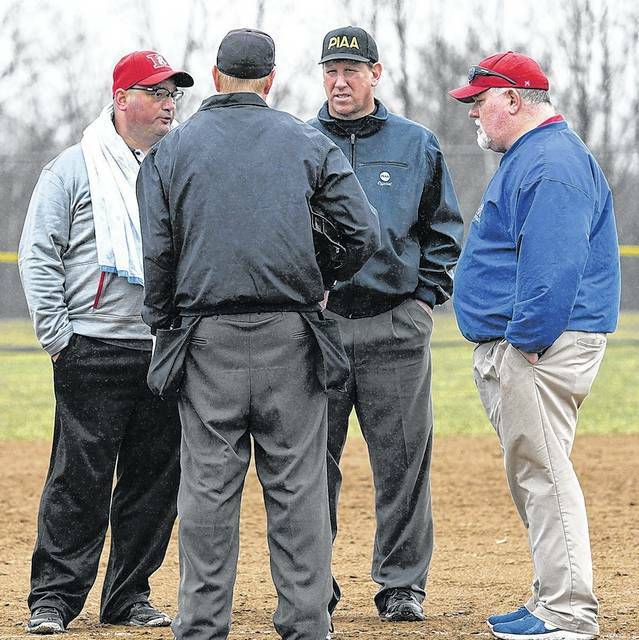 Hazleton Area softball coach Bob Bertoni, far left, and Pittston Area coach Vito Quaglia, far right, discuss suspending the game between the two schools. Hazleton Area was up 3-1 in the bottom of the third inning. 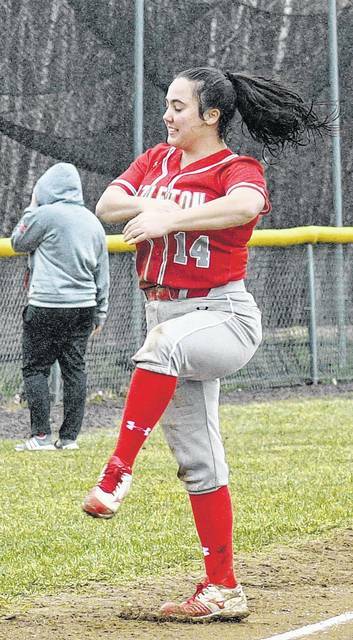 Hazleton Area’s Tiana Treon shows off her ballet skills during the rain delay against Pittston Area. 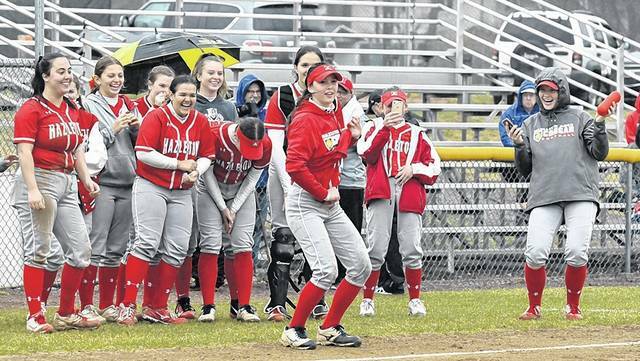 The battle of the unbeaten, Hazleton Area and Pittston Area, was suspended due to rain, but during the rain delay both teams had a bit of fun. 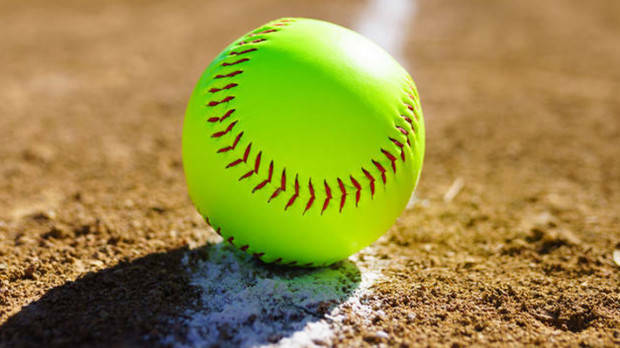 Hunter Kline and Krista Scoblick homered as Lake-Lehman upset Wyoming Seminary 7-4 on Thursday, knocking the Blue Knights from first place in Division 3 of Wyoming Valley Conference softball. Lehman improved to 2-3 in the division and 2-6 overall. Seminary dropped to 3-1 in the division and 6-3 overall. Kline finished with three RBI and Corinna Scoblick added two more as she went 2-for-4 at the plate. Jillian Ulozas was 3-for-4 with a triple and two runs scored. Lehman entered on a four-game losing streak where it allowed 11 or more runs in each contest. The Black Knights used a four-run sixth inning to snap a 3-3 tie. Tiana Wren was 2-f0r-4 with a double and two runs scored for Seminary. Aubrey Mytych was 2-for-3 with a double and two RBI. Kasidy Slusser struck out seven and helped out the offense with three RBI as Hanover Area took over first place in Division 3. Lindsey Mendygral, Sara Tuzinski and Emilee Bobos added RBI for the Hawkeyes (4-0 Div. 3, 7-1). Chloe Sromovski doubled and Kayla Andrejewski singled for the only hits by GAR (0-3 Div. 3, 1-4). Jalyn Cook pitched a complete game with eight strikeouts as Crestwood defeated Wyoming Valley West. Cook, Molly Truszkowski and Brooke Aton had two hits each for the Comets (2-2 Div. 1, 2-5). Andi Blaski was 3-for-3 for Valley West (2-2 Div. 1, 3-2). Sara Hoskins added a solo homer in the sixth inning to tie the score 2-2. 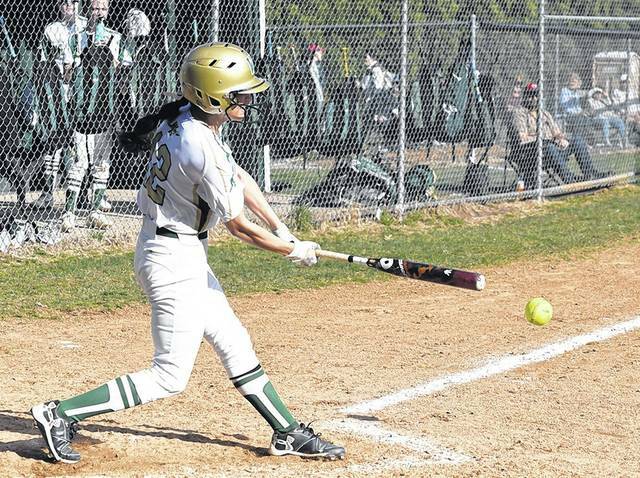 Nicole Cragle hit a grand slam in the third inning as part of her five-RBI game as Northwest defeated Holy Redeemer. Cragle also struck out eight as the Rangers improved to 4-1 in Division 3 and 7-1 overall. Trista Babcock was 3-for-4 with a RBI. Liz Mendrzycki had a double and an RBI for Redeemer (2-2 Div. 3, 2-3). Top Hitters: WS, Tiana Wren 2-4, 2B, 2 runs; Aubrey Mytych 2-3, 2B, 2 RBI; Alexus Dunn, 2B; Halle Kehl, 3B; Akira Kopec 1-4, RBI, run. LL, Jillian Ulozas 3-4, 3B, 2 runs; Krista Scoblick, HR, RBI, run; Corinna Scoblick 2-3, 2 RBI, run; Emily Smith 1-3, RBI; Jess Spencer, 3B, run; Hunter Kline 1-3, HR, 3 RBI, run. Pitching: WS, Delaney Romanchick (L) 6 IP, 10 H, 7 R, 6 ER, 2 BB, 5 SO. LL, Krista Scoblick (W) 7 IP, 9 H, 4 R, 3 ER, 1 BB, 1 SO. Top Hitters: GAR, Chloe Sromovski 1-2, 2B; Kayla Andrejewski 1-1. HA, Sarah Whitesell 1-2, 2 runs; Lindsey Mendygral 1-2, RBI, 2 runs; Sara Tuzinski 2-2, RBI, 3 runs; Emilee Bobos 1-3, 2B, RBI, 3 runs; Kasidy Slusser 2-3, 3 RBI. Pitching: GAR, Sromovski (W) 4 IP, 8 H, 10 R, 6 ER, 5 BB, 3 SO. HA, Slusser (W) 5 IP, 2 H, 0 R, 0 ER, 1 BB, 7 SO. Top Hitters: WVW, Andi Blaski 3-3; Sara Hoskins 1-3, HR; Aubrey Duesler run; Morgan Shedletsky RBI. CRE, Haley Naperkowski 1-4, run; Molly Trszkowski 2-3, 2B, run; Jalyn Cook 2-3; Brooke Aton 2-3; Abby Waite 2-3. Pitching: WVW, Hoskins (L) 7 IP, 9 H, 4 R, 4 ER, 2 BB, 5 SO. CRE, Cook (W) 7 IP, 5 H, 2 R, 2 ER, 2 BB, 8 SO. Top Hitters: HR, Liz Mendrzycki 2-4, 2B, RBI; Bailey McDermott 2-3; Olivia Murray 2-3. NWT, Nicole Cragle 1-3, grand slam, 5 RBI; Trista Babcock 3-4, RBI; Brenna Babcock 2-4. Pitching: HR, Mendrzycki (L) 3 IP, 4 H, 5 R, 5 ER, 3 BB, 3 SO; Jenna Santuk 3 IP, 4 H, 2 R, 0 ER, 0 BB, 6 SO. NWT, N.Cragle (W) 7 IP, 8 H, 2 R, 1 ER, 0 BB, 8 SO. WEST PITTSTON — Nearly three weeks since scoring their last run, the Berwick Bulldogs needed an offensive outburst sooner rather than later. It finally came in the eighth inning Tuesday. 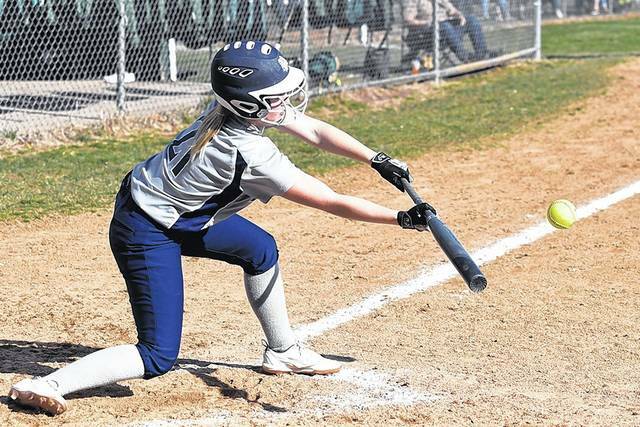 Sarah Dent had an RBI double and Emily Novicki later added a two-run homer as Berwick banged out four hits and scored four times in the extra inning to defeat Wyoming Area 6-3 in a Wyoming Valley Conference Division 2 softball game. Berwick (1-2 Div. 2, 2-2 overall) last scored in its season opener, a 6-5 non-conference win over North Schuylkill. Since then, the Dawgs were outscored 23-0 in two WVC games. 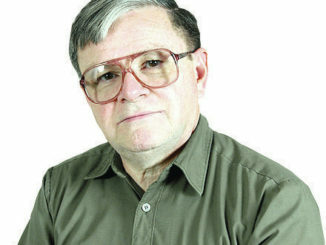 So any offense — even if it came aided by three Wyoming Area errors in the eighth — was a welcomed sight. “In the Tunkhannock game the other day, we struggled to catch up to (Kendra) Schultz’s pitching,” Berwick coach Emily Johnson said. “We hadn’t seen a lot of live pitching and our team is really young. We lost six seniors. (Monday) we just struggled. We were on our front foot, we made a lot of errors defensive, got down early and were never able to recover. Dent’s double that hit the left-field fence on one hop scored Katie Starr, who reached on an error. Dent later scored on an error to make it 4-2. Novicki then launched a two-run homer to left for the Dawgs’ final runs. Berwick also scored a run in the fourth to tie the score 2-2 as consecutive singles by Hannah Hess and Novicki were followed by a sacrifice fly by Kelsey Caladie. While Berwick was able to bunch its hit to score, Wyoming Area couldn’t do the same. The Warriors had seven hits, but no more than one in any inning. They took a 2-1 lead in the third when Kari Melberger smoked a grounder down the third-base line to score Bri Pizzano and Nicole Selinskie. 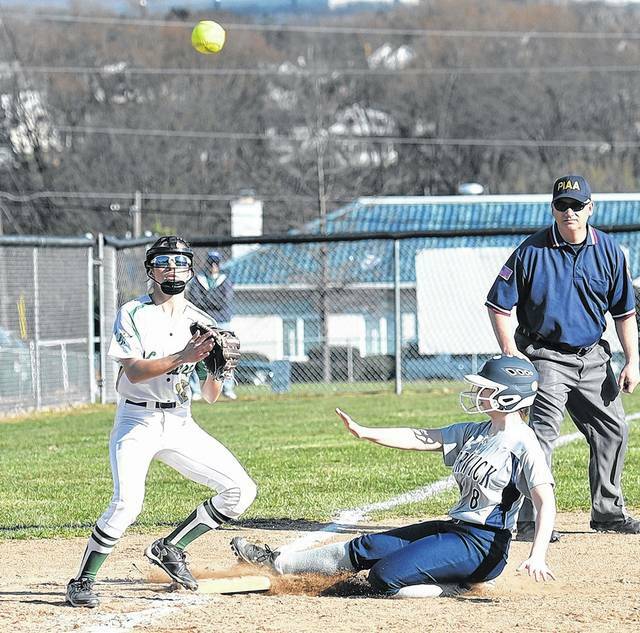 Aleaha Kranson and Kate Slusser were hit by pitched after Melberger’s double, but Wyoming Area left the bases loaded. Slusser took a direct hit to her left ankle and was down for awhile, but later returned to the game. 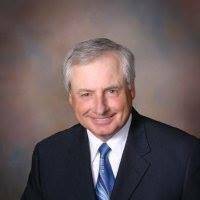 Like Berwick, Wyoming Area (1-2 Div. 2, 3-3) lost six starters from a team that made it to the District 2 Class 4A semifinal last season. And like Berwick, the Warriors are seeking some offensive consistency. 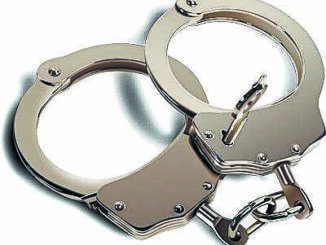 Wyoming Area left a runner stranded on second in the fifth, another stranded on third in the sixth and a baserunning miscue in the seventh led to a runner being thrown out at third for the second out. The Warriors won’t have much time to regroup. They have three games in the next four days, including a long bus ride to Western Wayne on Saturday for a non-conference contest. Pittston Area scored five times in the bottom of the sixth to end the game due to the 10-run rule. Lexi Felinski was 3-for-4 with a triple, two RBI and three runs scored. Gabby Para was 3-for-4 with a double, two RBI and two runs scored. Alexa McHugh was 3-for-4 with two doubles and two RBI. Toni Para knocked in three runs. Brinley Scobeck doubled in Nanticoke Area’s only run in the first inning. Jena Simmons homered, doubled twice and drove in six runs as the Tigers won in four innings due to the 15-run rule. Winning pitcher Kendra Schultz struck out 10 and allowed two hits. She was also 3-for-4 at the plate with a double and two RBI. Also knocking in two runs were Faith Jones, Gina Walsh and Erin Dunn. Tunkhannock finished with 20 hits. 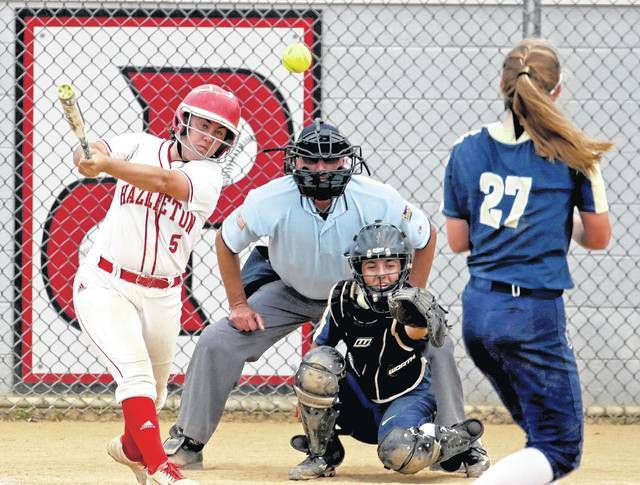 Julia Mooney homered and drove in two runs and Tiana Treon was 4-for-4 with two doubles and two RBI as Hazleton Area defeated Crestwood. Olivia Wolk also drove in two runs for the Cougars. Pitcher Aleah Kost went the distance, allowing four hits. Jalyn Cook and Abby Waite had an RBI each for Crestwood. Amanda Cheslow hit a three-run homer and Aleigha Parnell added a two-run shot as Northwest overpowered Meyers. Cheslaw, Trista Babcock and Kelly Harvey finished with four RBI each. Brenna Babcock knocked in three runs. Lael Walker accounted for all of Meyers’ runs with a grand slam in the bottom of the fifth. 2B: Starr, Melberger, Kranson. HR: Nowicki. Top Hitters: NA, Brinley Sobeck 2B, RBI. PA, Gabby Para 3-4, 2B, 2 RBI, 2 runs; Lexi Felinski 3-4, 3B, 2 RBI, 3 runs; Alexa McHugh 3-4, two 2B, 2 RBI; Toni Para 1-4, 3 RBI; Bernadette Lieback 1-2, 2B, 2 RBI. Pitching: NA, Sobeck (L) 5.2 IP, 14 H, 11 R, 9 ER, 0 BB, 3 SO. PA, McHugh (W) 6 IP, 4 H, 1 R, 1 ER, 2 BB, 6 SO. Top Hitters: DAL, Christina Schappert 1-2, 2B; Samantha Kern 1-2. TUN, Faith Jones 2-3, 2B, 2 RBI, 2 runs; Hope Jones 3-3, 2B, 3B, 4 runs; Kendra Schultz 3-4, 2B, 2 RBI, 2 runs; Jena Simmons, 3-3, 2B, HR, 6 RBI, run; Hailey Farr 2-3, 2B; Makayla Quick 2-3, run; Gina Walsh 2-3, 2 RBI, run; Erin Dunn 3-3, 3B, 2 RBI, run. Pitching: DAL, Sydney Hornlein (L) 3.1 IP, 20 H, 15 R, 15 ER, 0 BB, 3 SO. TUN, Schultz (W) 4.0 IP, 2 H, 0 R, 0 ER, 0 BB, 10 SO. Top Hitters: HA, Tian Treon 4-4, two 2B, 2 run; Olivia Wolk 1-4, 2 RBI; Julia Mooney 2-4, HR, 2 RBI, 2 runs; Gianna Gombeda 2-3, 2B, RBI, run; Kyra Antolick 2-4, 2B, RBI, run; Julia Mrochko 1-5, 2B, run. CRE, Haley Naperkowski 1-2, 2B; Madyson Sobolewski 1-3, run; Jalyn Cook 1-3, RBI; Abby Waite 1-3, RBI. Pitching: HA, Aleah Kost (W) 7 IP, 4 H, 2 R, 2 ER, 1 BB, 3 SO. CRE, Cook (L) 7 IP, 13 H, 9 R, 9 ER, 3 BB, 4 SO. Top Hitters: NWT, Courtney Cragle 2-3, 2B, 3 runs; Brenna Babcock 1-3, 3 RBI, 2 runs; Trista Babcock 3-4, 4 RBI, 2 runs; Amanda Chesl0w 3-3, HR, 4 RBI, 4 runs; Aleigha Parnell 1-3, HR, 2 RBI, 2 runs. MEY, Lael Walker 1-3, HR, 4 RBI, run; Isabelle Davies 1-1, run. Pitching: NWT, Nicole Cragle (W) 5 IP, 2 H, 4 R, 0 ER, 1 BB, 5 SO; MEY, Abbi Satoff (L) 3.2 IP, 10 H, 12 R, 12 ER, 2 BB, 0 SO; Jenna Kasper 1.0 IP, 0 H, 2 R, 2 ER, 4 BB, 1 SO; Lael Walker 0.1 IP, 3 H, 4 R, 4 ER, 2 BB, 0 SO. Berwick’s Hannah Hess drills a single against Wyoming Area in a WVC Division 2 game Tuesday. Berwick starting pitcher Emma Stoker ducks as third baseman Hannah Hess tosses to first for an out against Wyoming Area on Tuesday. Berwick’s Peyton Lipsey lays down a bunt in the third inning to advance the runner at first. Berwick’s Sarah Dent slides into third base as Wyoming Area’s Kari Melberger waits for the throw during Tuesday’s game. Wyoming Area’s Kari Melberger hits a hot grounder for a double in the third inning, driving in two runs for the Warriors against Berwick on Tuesday. WILKES-BARRE — A player who had a big role in Holy Redeemer’s long winning streak played a big role in its demise Monday. 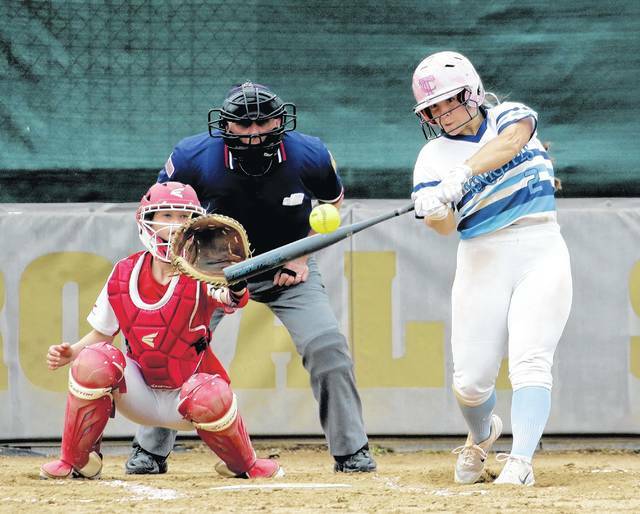 Tiana Wren crushed a three-run homer in the third inning against her former teammates as Wyoming Seminary defeated Redeemer 11-5, ending the Royals’ Wyoming Valley Conference Division 3 softball winning streak at 78 games. Wren was a three-time all-state selection at Redeemer before transferring to Seminary for her senior year. She finished 2-of-2, also hitting a double, walked three times, scored three times, stole three bases and knocked in four runs. Since moving to Division 3 in 2013, Redeemer hadn’t lost a regular-season game in winning six consecutive divisional championships. The Royals played for the PIAA Class 3A state title last year, but lost three key players from that team. Not only is the power-hitting Wren gone, so are four-time all-state pitcher Morgan Bienkowski and offensive spark plug Samantha Rajza. “That’s not a big deal to us,” Redeemer coach Jerry Paulukonis said of the streak ending. “Every year is a new team. You work hard to keep winning games and you keep getting better as the year goes on. Seminary (3-0 Div. 3, 7-2 overall) led 4-2 after two innings as Aubrey Mytych had a two-run single and Alexus Dunn singled in a run in the first inning and Wren doubled in a run in the second. The Blue Knights distanced themselves in the third. Right after nine-hole hitter Riley Jensen singled in two runs, Wren demolished a pitch not only over the left-field fence but over the row of trees beyond the fence for a three-run homer. In all, every Sem batter either had a hit, scored, got on base or drove in a run. Seminary starter Delaney Romanchick pretty much shut down Redeemer (2-1 Div. 3, 2-2) after that. She gave up an RBI single to Taylor Josefowicz in the fifth and the Royals scored their final run on an error in the seventh. McKenna Dolan hit a solo homer in the third for Redeemer as part of her 3-for-4 day. Christina Schappert hit a three-run homer in the bottom of the fifth, allowing Dallas to end the game via the 10-run rule. Mia Dixon had a double and scored twice for Dallas. Sydney Hornlein threw a complete game, allowing two hits and striking out two. Peyton Lipsey had a double for Berwick. 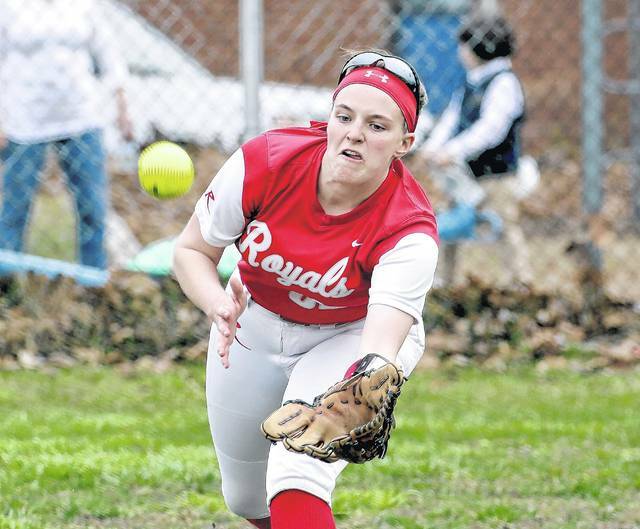 Kasidy Slusser was 3-for-3 with a solo homer and Sara Tuzinski threw a two-hitter with nine strikeouts as Hanover Area knocked off Lake-Lehman. Emilee Bobos finished 2-for-3 with a double and three RBI for the Hawkeyes. Alessia Mangan added a double. 2B — Wren, Jensen. 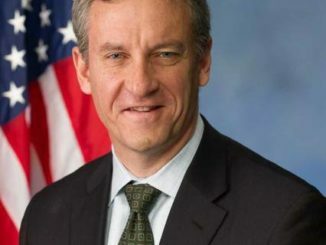 HR — Wren, McKenna. Top Hitters: BER, Peyton Lipsey 2B; McKenzie Waltman 1B. DAL, Christina Schappery HR, 3 RBI; Sydney Hornlein 1-2, 2 RBI; Mia Dixon 1-3, 2B, 2 runs; Gianna Spaciano 1-2, 3 runs. Pitching: BER, Emma Stoker (L) 0.1 IP, 2 H, 5 R, 3 ER, 3 BB, 0 SO; Emily Novicki 4.0 IP, 4 H, 7 R, 5 ER, 2 BB, 3 SO. Hanover Area 11, Lake-Lehman 1 (5 inn). Top Hitters: LL, Jillian Ulozas 1-2, run; Savannah Purdy 1-2. HA, Sarah Whitesell 1-2, 2 runs; Lindsey Mendygral 2-3. 2B, RBI, run; Emilee Bobos 2-3, 2B, 3 RBI, 3 runs; Kasidy Slusser 3-3, HR, 1 RBI, 2 runs. Pitching: LL, Krista Scoblick (L) 5 IP, 11 H, 11 R, 6 ER, 1 BB, 1 SO. HA, Sara Tuzinski (W) 5 IP, 2 H, 1 R, 0 ER, 0 BB, 9 SO. Wyoming Seminary’s Tiana Wren hits a three-run homer to left field in the third inning Monday. Seminary won 11-5 to end Holy Redeemer’s 78-game WVC Division 3 winning streak. 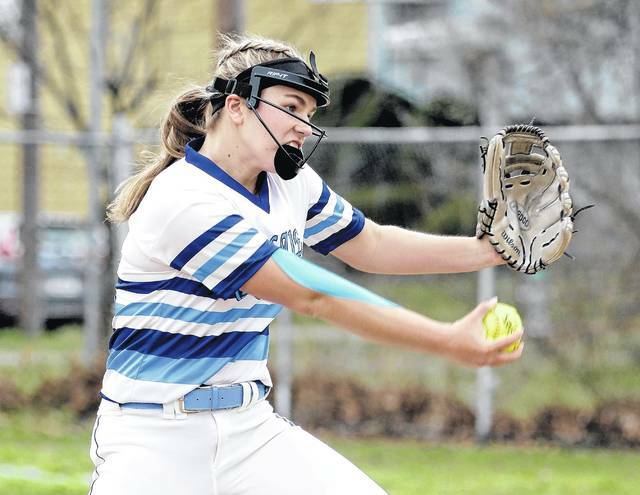 Wyoming Seminary pitcher Delaney Romanchick delivers the ball against Holy Redeemer in WVC softball action Monday. 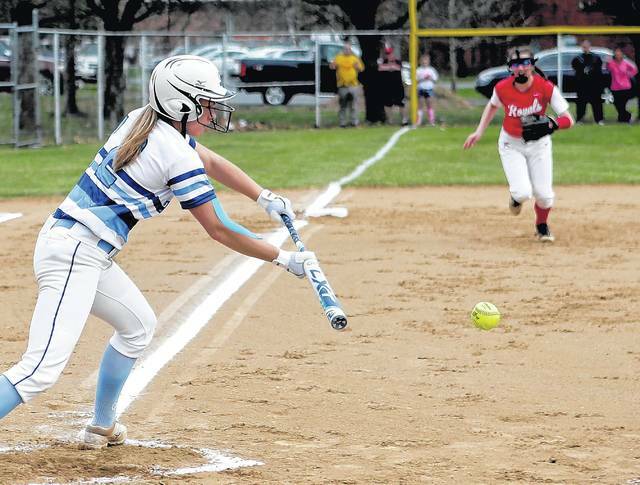 Wyoming Seminary’s Delaney Romanchick lays down a sacrifice bunt against Holy Redeemer in the first inning Monday. 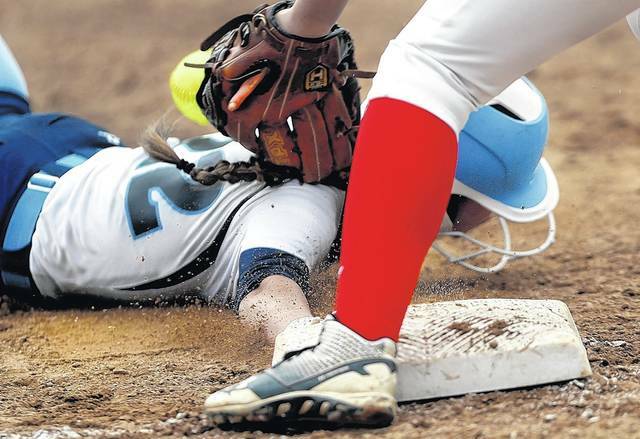 Holy Redeemer right fielder Meredythe Baird dives for the ball on a Wyoming Seminary hit in WVC softball action Monday. Wyoming Seminary’s Lauren Fletcher, right, high-fives teammate Delaney Romanchick after scoring a run against Holy Redeemer in WVC softball action Monday. 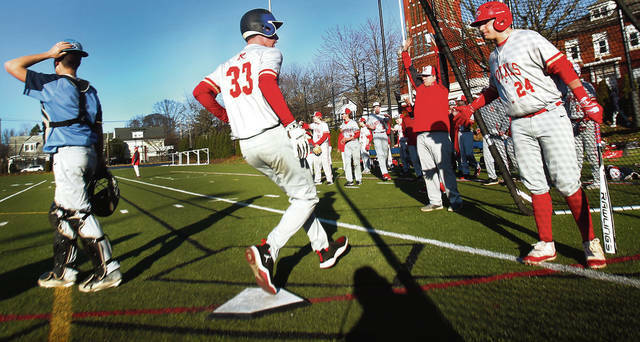 MOOSIC — Through its first five games of the young baseball season, Hazleton Area has been hitting the cover off the ball, scoring 56 runs. The potent offensive numbers didn’t startle Wyoming Valley West’s sophomore starter on Sunday afternoon at PNC Field. 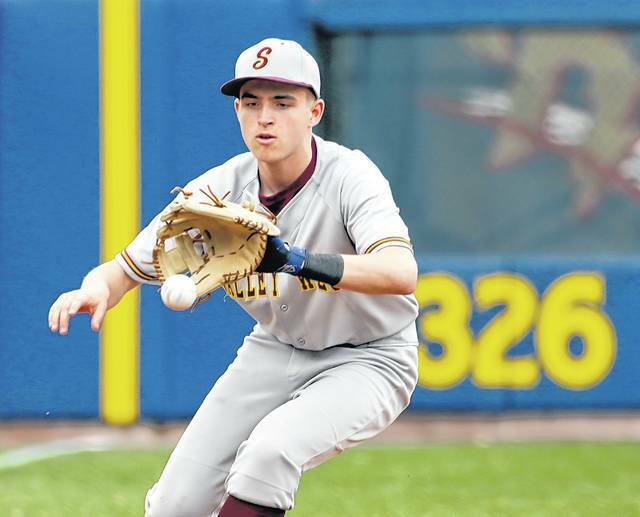 Rich Kolesar kept the Cougars in check, only allowing four hits and one run while getting some big plays from the defense behind him in the Spartans 2-1 win over Hazleton Area. Kolesar finished two outs shy of tossing a complete game as the Cougars loaded the bases in the bottom of the seventh and a tiring Kolesar could only get one out. “We had some guys make some plays and I was just throwing my pitches. When they hit the ball, we made our plays and got some outs,” Kolesar said. Tom Federici finished off the victory, inducing a grounder back to the mound and a flyout to center field to end the game. Kolesar was stellar in the outing. Two of the hits he allowed came in the third inning. After a single in the third, he didn’t give up another knock until the last batter he faced, as JT Vozar knocked an infield single with one out in the bottom of the seventh. “The last few innings I was getting a little tired. I was throwing them in the dirt. My arm was getting a little sore. 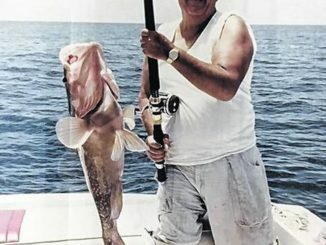 But we had Fed come out here and finish it off,” Kolesar said. The Spartans got the scoring started in the top of the first inning, sending seven to the plate against Cougars right-hander Frank DeGaetano, who struck out the side in the inning. But DeGaetano also walked two, allowed two hits and uncorked a wild pitch in the frame, scoring the run to give WVW a 1-0 lead. Valley West tacked on another run in the second, taking advantage of a pair of walks and a Cougars error to score on a groundout by Mike Kane for a 2-0 lead. After getting a runner thrown out at the plate to end the second, the Cougars got on the board in the third when Alex Amentler doubled and scored on a ground out to cut the lead to 2-1. The Spartans stayed in front thanks in part to a runner getting nailed at the plate to end the previous inning. Once DeGaetano was lifted with one out in the top of the third, Gabe Colyer mowed down the Spartans, retiring 10 in a row before allowing a walk in the sixth inning. The righty only gave up one walk and didn’t allow any hits in 3.2 innings of work. This coming after a rough outing a few days earlier against Crestwood. 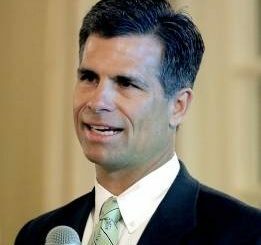 Even though the Cougars were hit with their first loss, head coach Russ Canzler said it could be a good loss. Hazleton Area first baseman Jerome Repetz, right, moves into position as Wyoming Valley West base runner Ben Bowen takes a lead at PNC Field in Moosic on Sunday. 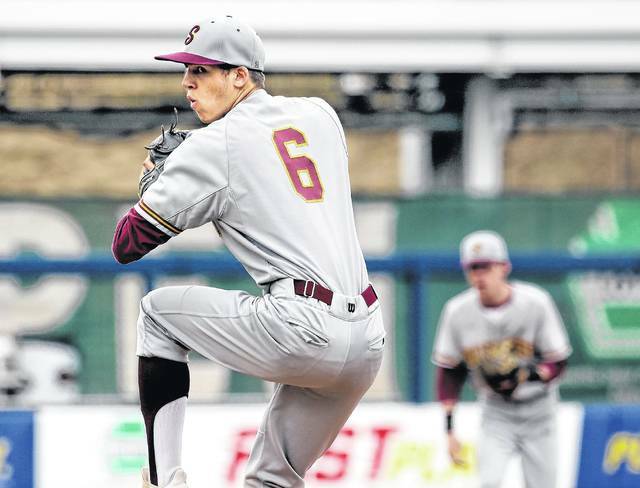 Wyoming Valley West starter Rich Kolesar delivers a pitch against Hazleton Area Sunday at PNC Field in Moosic. Wyoming Valley West third baseman Tom Federici fields a chopper against Hazleton Area Sunday afternoon at PNC Field in Moosic. Wyoming Valley West’s Garrett Vought scores the first run of the game as Hazleton Area pitcher Frank DeGaetano covers the plate at PNC Field in Moosic on Sunday afternoon. 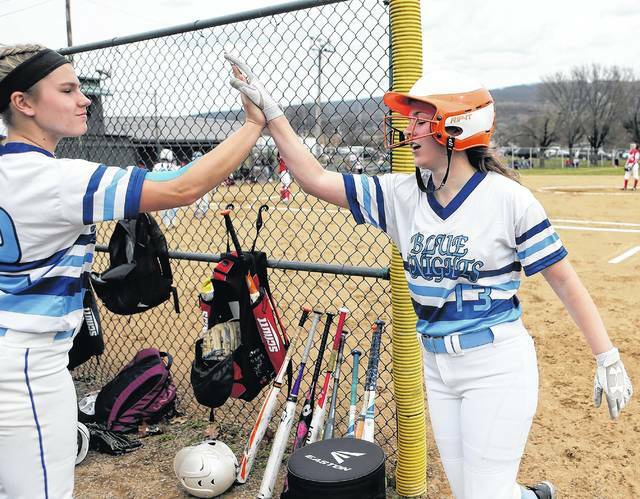 Wyoming Valley Conference softball has already reach a major accomplishment. The season started on time. Opening Day was Monday and all but one game was played. That’s unusual since the start date in recent years was more of a suggestion than something etched in stone. Snow, rain and unplayable field conditions often made the first week a mess. Some teams never got on a diamond until their first game. This season, though, nearly every team had played some non-conference games before the WVC season started. And those non-conference games now count toward making the District 2 playoffs. 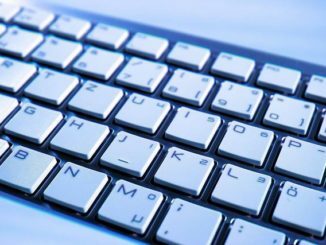 The district will be using the Power Rating System to determine playoff seedings. 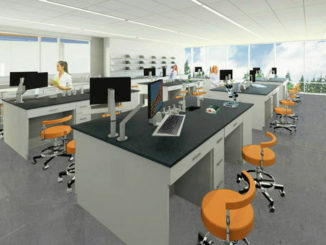 The system was used for some sports in the fall and winter. The mathematical formula takes into account wins, losses and opponents’ winning percentages. As for the divisions, Hazleton Area looks as the favorite once again in Division 1 with Pittston Area appearing the Cougars’ closest competition. Tunkhannock is the defending Division 2 champion. Division 2, though, has traditionally been the toughest top to bottom. Holy Redeemer has won six consecutive Division 3 titles and hasn’t lost a divisional game during that span. However, the Royals are a bit down this year and that could open the door for Wyoming Seminary or Northwest. Hanover Area could be the sleeper in Division 3. Home Field: Birchwood Complex, Plains Twp. Key Players Lost: Taylor Pawlush; Molly Poray. Key Players Returning: Stacy Balent, 3B, Sr.; Alexa Berecin, 1B, Sr.; Ashley Tomeo, SS, Sr.; Morgan Gyaton, C, Jr.; Jordan Pugh, P, Jr.
Outlook: Coughlin won a WVC game last season for the first time since 2014. The program hasn’t had a winning record since 2005 and this season will be the final crack at breaking the slide. 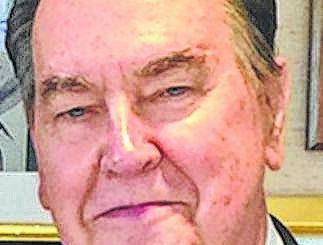 The school’s athletic programs merger with GAR and Meyers in the fall. Key Players Returning: Haley Naperkowski, SS, Sr.; Cameron O’Neill, C, Sr.
Outlook: Crestwood is rather young overall, but Koptcho has been pleased with the hard work. Offense was an issue last season as the Comets were shut out three times in WVC play. They also allowed 11 or more runs seven times. They should improve as the season wears on. Home Field: 23rd St., behind high school, Hazle Twp. Key Players Returning: Kyra Antolick, OF, Jr.; Aleah Kost, P-IF, Jr.; Marissa Trivelpiece, SS, Jr.; Tiana Treon, 3B, Jr.;Caitlyn Katchur, P-IF, So. ; Julia Mooney, C-1B, So. ; Julia Mrochko, 2B-OF, So. ; Olivia Wolk, C-OF, So. Outlook: Hazleton Area has a new coach, but is once again the team to beat in the division. Treon (.600), Trivelpiece (.448), Wolk (.400), Mrochko (.386) and Antolick (.368) are part of a dangerous offense. The defense is strong as well. Kost and Katchur take over the pitching duties. There’s a good chance of the team playing into June. 2018 Postseason: D2/11-5A Playoffs – Wallenpaupack, W 1-0; Abington Heights, W 13-2; PIAA 5A State Playoffs – WC Henderson, W 10-2; Solanco, L 1-0. Key Players Returning: Lexi Felinski, IF, Sr.; Bailey Loyack, C, Sr.; Alexa McHugh, P-IF, Sr.; Shayla Williams, OF, Sr.; Gabby Para, OF, Jr.; Madisyn Antal, IF, Jr.; Kahler Kivler, OF, Jr.; Tiara George, IF, So. Outlook: The Patriots return eight starters from a team that won the school’s first district title. McHugh hit .514 last season while Felinski hit .465 and led the WVC in triples. The speedy Para hit .424. Pittston Area is certainly strong enough to make a run at the division and district crowns. Key Players Returning: Andi Blaski, CF, Sr.; Julia Franks, 2B, Jr.; Sara Hoskins, P-SS, So. Outlook: Offense was Valley West’s main problem last season as the Spartans were shut out five times and scored two runs or less three times. They’re fairly young overall, so this might be a bit of a rebuilding year. Still, the Spartans could end up surprising some teams throughout the season. Key Players Returning: Emma Stoker, P-INF, Sr.; Kelsey Caladie, IF, Jr.; Sarah Dent, INF-C, Jr.; Emily Novicki, P-IF, So. ; Katie Starr, OF, So. Outlook: Berwick snapped a slide of two consecutive losing seasons in 2018. Seven games were decided by one run, with the Dawgs losing four of them. A couple big bats need to be replaced, but the pitching should be solid since Stoker has logged some innings. The division, though, is tough top to bottom. Key Players Returning: Mia Dixon, OF, Sr.; Samantha Kern, OF, Sr.; Christine Schappert, 3B, Sr.; Gianna Spaciano, 2B, Sr.; Lyndsey Hornlein, 1B, Jr.; Sydney Hornlein, P-INF, Jr.; Madison Pokarsky, IF, Jr.; Abby Jayne, P, So. 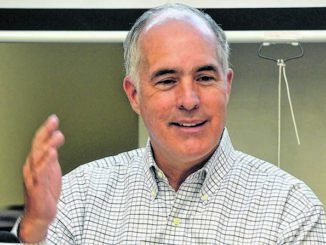 Outlook: The Mountaineers should be strong defensively up the middle and in the outfield. Pitching also looks promising with two hurlers coming back. What plagued Dallas last season was offensive consistency. Four losses by two runs or less were the difference in a winning season in 2018. 2018 Postseason: D2-4A Playoffs – Berwick, W 11-6; Valley View, W 7-0; Tunkhannock, L 2-1 10 inn. ; PIAA 4A State Playoffs – Upper Perkiomen, W 4-3 9 inn. ; East Pennsboro, W 3-2 14 inn. ; Bethlehem Catholic, L 11-0. 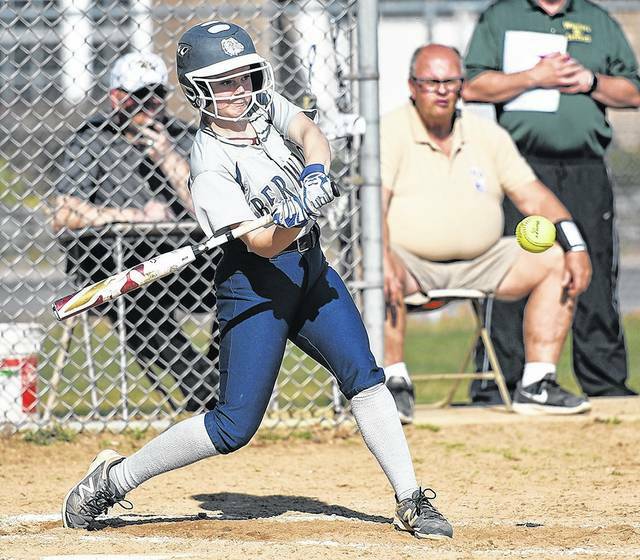 Key Players Returning: Jilann Baron, 1B, Sr.; Katie King, C, Sr.; Liz Redenski, OF, Sr.; Brittany Sobeck, P-2B, Sr.; Jen Kurkowski, OF, Jr.; Gabby Rakowski, SS, Jr.
Outlook: Nanticoke Area has a huge void to fill as Bohn was one of the top pitchers in the state over the past two seasons. She was capable of shutting down some powerful hitting lineups and keeping the Trojanettes in games. There is talent back, but getting all the piece together could take some time. 2018 Postseason: D2-4A Playoffs – Honesdale, W 4-0; Wyoming Area, W 1-0; Nanticoke Area, W 2-1 10 inn. ; PIAA Class 4A State Playoffs – Bishop McDevitt, W 7-2; Bethlehem Catholic, L 4-1. Key Players Returning: Erin Dunn, OF, Sr.; Hailey Farr, C-OF, Sr.; Faith Jones, SS, Sr.; Hope Jones, P-2B, Sr.; Kendra Schultz, P-OF, Sr.; Jena Simmons, 3B, Sr.;Mackayla Quick, 1B, Jr.; Gina Walsh, OF, Jr.; Ella Larioni, OF, So. Outlook: Tunkhannock is arguably the most complete team in the WVC. Schultz and Hope Jones provide a one-two punch in the circle. Faith Jones (.438), Hope Jones (.389) and power hitter Jena Simmons lead an offense that is strong top to bottom. A district title and a strong run in states are quite possible. 2018 Postseason: D2-4A Playoffs – West Scranton, W 6-0; Tunkhannock, L 1-0. Key Players Returning: Kari Melberger, OF, Jr.; Bri Pizzano, SS-2B, Jr.; Nicole Silinskie, 2B-OF, Jr.
Outlook: Wyoming Area was hit hard by graduation, losing its top two pitchers and top two hitters. Pizzano (.400) and Silinskie (.393) lead an offense that has many questions heading into the WVC schedule. The Warriors are young with only two seniors, including a newcomer, on the roster. Key Players Returning: Kayla Andrzejewski, OF, Sr.; Sabrina Nunez, 3B, Sr.; Oliva Prato, SS, Sr.; Sarah Youkoski, 1B, Sr.; Chloe Sromovoski, P, Jr.; Erin Leonard, C, So. Outlook: The Grenadiers bring back everyone for their final season before merging with Coughlin and Meyers. The experience could result in a few more victories, but it will be difficult to get near .500. The team bumps up to Class 4A. Key Players Returning: Emilee Bobos, 3B, Sr.; Sara Whitesell, OF, Sr.; Alessia Mangan, OF, Jr.; Lindsey Mendygral, 1B, Jr.; Sarah Tuzinski, P-SS, Jr.; Molly Corbett, C-IF, So. ; Kasidy Slusser, P-SS, So. 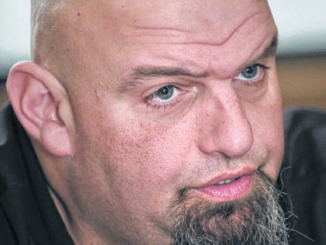 Outlook: Hanover Area bumps up a class where the sledding will be tougher to make districts. The good news is the Hawkeyes were very young last season and should improve with a year under their belts. Whitesell and Bobos are veterans and the only seniors on the roster. Could have a shot at the division if things fall in place. 2018 Postseason: D2-3A Playoffs – Dunmore, W 4-0; Mid Valley, W 1-0; Montrose, W 8-0; PIAA 3A State Playoffs – Loyalsock, W 4-1; Springfield-Montco, W 11-1; North Schuylkill, W 2-0; Philipsburg-Osceola, L 8-3. Key Players Returning: McKenna Dolan, IF, Sr.; Taylor Josefowicz, 1B, Sr.; Allyson Laiuvara, OF, Sr.; Olivia Murray, So., OF; Lynzie Skoronski, C-IF, So. 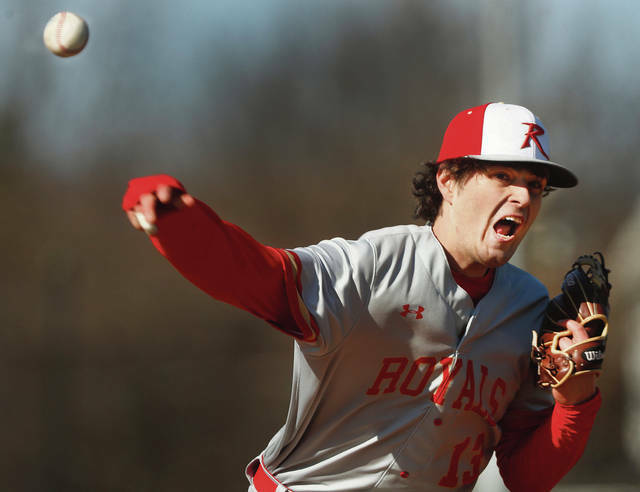 Outlook: Redeemer made it to the Class 3A state title game last season, but graduated the WVC’s top pitcher in Bienkowski and lost the WVC’s best power hitter Wren to transfer. 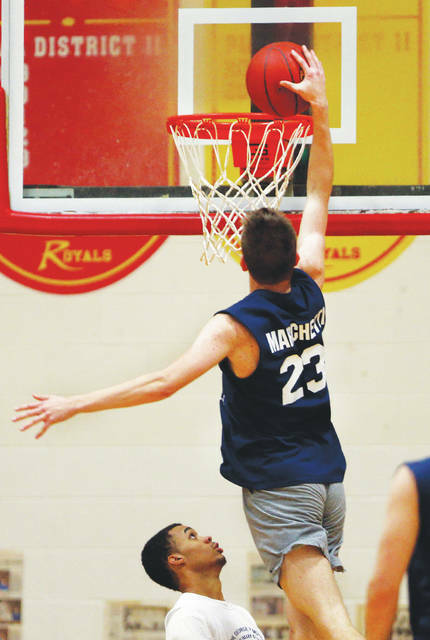 The Royals still have talent, but whether they can continue their dominance of Division 3 is a big question mark. Outlook: Like Hanover Area, Lehman moves up a class where making the postseason will be tougher. The Black Knights lost key components on offense and need to replace veteran Hogan in the circle. Chipego, though, is optimistic the team will have a successful season. Key Players Returning: Ashley Bruno, OF, Sr.; Dakota Zyskowski, OF-IF, Sr.
Outlook: Meyers hasn’t finished with a winning record since 2010 and this is the last chance to break that. The Mohawks entered the season with plenty of unknowns, but have been competitive in a few games thus far. There’s a chance for improvement on last season’s record. Outlook: MMI Prep had eight of 14 WVC games last season ended by the 10-run rule. Offense was an issue as the Preppers scored two or fewer runs 10 times. The team is very young, consisting of freshmen and sophomores, so there is room to grow this season. 2018 Postseason: D2-2A Playoffs – Wyoming Seminary, W 6-5; Holy Cross, L 7-3. Key Players Returning: Brenna Babcock, OF-3B, Sr.; Trista Babcock, SS-P, Sr.; Courtney Cragle, C, Sr.; Emily Culver, OF, Sr.; Nicole Cragle, P-1B, Sr.; Aleigha Parnell, P-2B, So. Outlook: Northwest returns five starters who will be supplemented by some promising underclassmen. The Rangers should be solid enough pitching and hitting to content for the divisional and district title. The big question going into the season was how the defense would perform. Key Players Returning: Lauren Fletcher, OF, Sr.; Halle Kehl, 1B, Sr.; Aubrey Mytych, OF, Sr.; Tiana Wren, SS, Sr. (transferred from Redeemer); Emma Bean, OF, Jr.; Alexus Dunn, 3B, Jr.; Kylee Kolbicka, OF, Jr.; Delaney Romanchik, P, Jr.
Outlook: The Blue Knights bring just about everyone back and added Wren, one of the WVC’s top power hitters, via transfer. Romanchick is a Drexel University recruit and should be better this season. If any team has a chance of ending Redeemer’s six-year divisional reign, it’s Seminary. Tiana Treon is part of a powerful Hazleton Area offense. 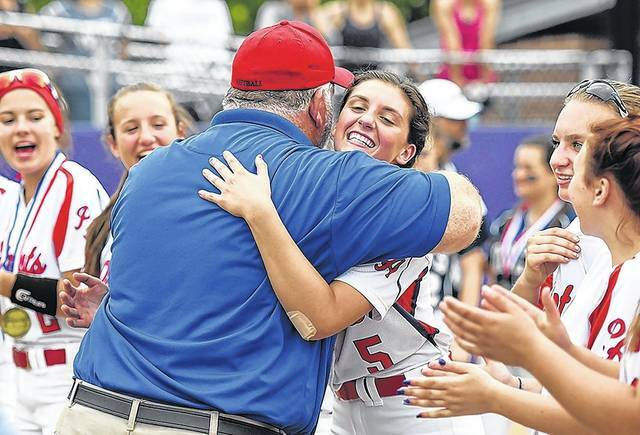 Pittston Area coach Vito Quaglia hugs Alexa McHugh after the Patriots won their first District 2 softball title in school history last year. 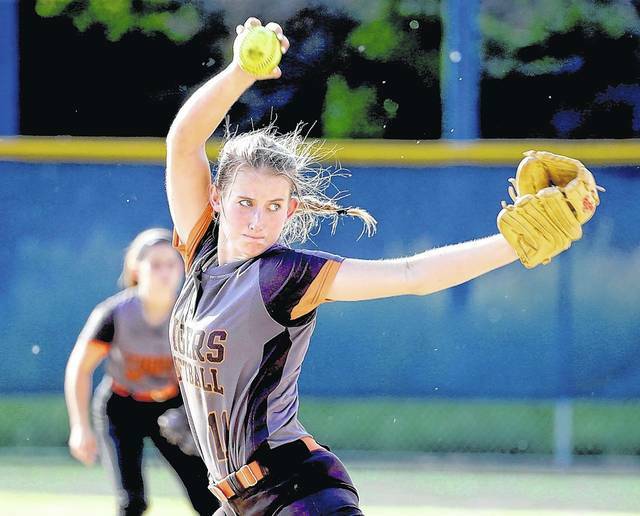 Kendra Schultz and teammate Hope Jones give Tunkhannock the top pitching duo in the WVC. 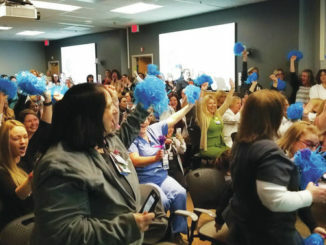 WILKES-BARRE — Rest assured, when the real Wolfpack take the court next season, the game plan will be a little more complex. It worked. 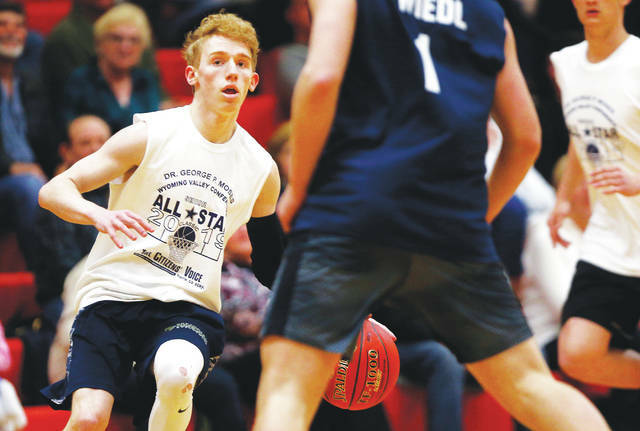 The Wolfpack team connected on 18 3-pointers — with Coughlin’s Aaron Bennett leading the way — as it defeated the Beggs/Lunger team 113-105 in the 50th annual Dr. George P. Moses Boys Basketball Classic on Friday night. 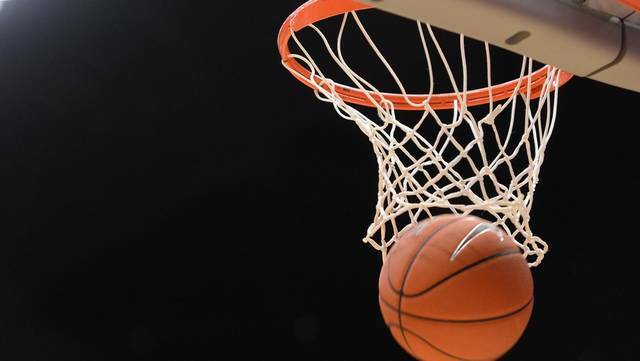 The near-capacity crowd at Holy Redeemer High School saw Bennett hit three consecutive 3-pointers just past the midway point of the second half as the Wolfpack boosted its advantage to 97-77. Bennett finished with five 3-pointers and a team-high 17 points to be named his squad’s MVP. “I got hot, so I kept chucking them,” Bennett said. Hanover Area’s Evan Materna scored 13 to lead Beggs/Lunger and earn his team’s MVP honors. The halftime 3-point shooting contest resulted in a bit of an upset. Dallas’ Justin Finarelli edged Nanticoke Area’s Nate Kreitzer 12-11. Finarelli wasn’t known as a big 3-point threat this past season, while Kreitzer is his school’s all-time 3-point leader. The Wolfpack — named for next school year’s merger of the athletic programs of Coughlin, GAR and Meyers — used a 14-2 run to start the game and never looked back. GAR’s Will Johnson scored on a drive for a 4-2 Wolfpack lead and consecutive 3-pointers by Meyers’ Kendall Brewster and Northwest’s Tyler Stevens made it 14-2. Beggs/Lunger managed to cut the deficit to 25-23 midway through the opening half — two 20-minute halves were played — but five consecutive points by Holy Redeemer’s Collin Cook put the Wolfpack back in control. The game played out like that the rest of the way. Every time Beggs/Spencer closed the gap, the Wolfpack responded. GAR’s Tyler Young led an outburst to start the second half. Just before Bennett’s 3-point display, Hazleton Area’s Warren Seigendall put on a 6-0 spree. The lead ballooned to 160-87 with about five minutes left before Beggs/Lunger was able to make the final score more respectable. Aside from Materna, two other Beggs/Lunger players scored in double figures. Crestwood’s Mike Paliermo had 13 points and Wyoming Seminary’s Dimitri Gnall had 10. MMI Prep’s Matt Marchetti and Tunkhannock’s Tyler Faux added nine each. Gnall and Marchetti had the only dunks of the game. Cook scored 16 and Brewster finished with 12 for the Wolfpack. Seigendall and Redeemer’s Nick Prociak had 10 each. Toole was assisted by two other former Wilkes-Barre coaches — Coughlin’s Mike Day and GAR’s Jerry Altavilla. The Beggs/Lunger team was coached by Nanticoke Area’s John Beggs and Tunkhannock’s Spencer Lunger. BEGGS/LUNGER (105) — Dan Wiedl 0 0-0 0, Nate Kreitzer 3 0-0 7, Frank Casarella 1 0-0 2, Sevion Leak 2 1-1 7, Sean Murphy 1 0-0 3, Tyler Faux 4 0-0 9, Nick Reposa 1 0-0 3, Trahjan Krupinski 1 0-0 2, Zach Evans 3 2-2 8, Matt Marchetti 4 0-0 9, Camden Boris 2 0-0 5, Dylan Szychowski 0 0-0 0, Avery Billings 3 0-0 6, Evan Materna 4 1-1 13, Mike Palmiero 4 2-3 12, Dimitri Gnall 5 0-0 10, CJ Cercone 1 0-0 3, Nick Ganter 1 0-0 3. Totals 42 4-5 105. WOLFPACK (111) — Will Johnson 4 0-0 9, Kyle Franek 2 0-0 5, Nick Prociak 5 0-0 10, Kendall Brewster 5 0-0 12, Tyler Stevens 1 0-0 3, Tyler Young 2 0-0 6, Collin Cook 6 0-0 16, Justin Finarelli 2 1-2 5, Aaron Bennett 6 0-0 17, Warren Seigendall 4 2-2 10, Jared O’Day 1 0-0 3, Sam Saxe 1 0-0 3, Jaxson Yaple 2 0-0 5, Keegan Brewster 2 0-0 5, Tony Egidio 2 0-0 5, Bryce Koser 1 0-0 2. Totals 46 3-4 111. Three-point goals — BL 14 (Kreitzer 2, Leak 2, Murphy, Faux, Reposa, Marchetti, Boris, Materna 4, Palmiero, Cercone). WP 18 (Johnson, Franek, Ken.Brewster 2, Stevens, Young 2, Cook 4, Bennett 5, O’Day, Saxe, Yaple). MMI Prep’s Matt Marchetti scores a basket for the Beggs/Lunger Team during the Dr. George P. Moses All-Star Classic at Holy Redeemer High School on Friday. 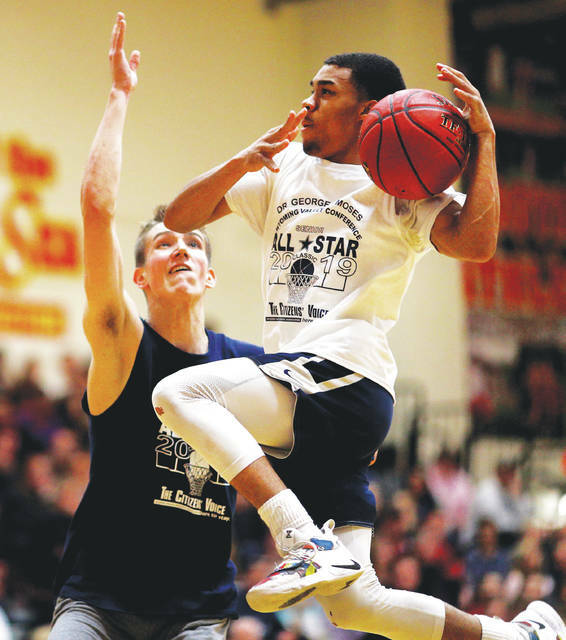 GAR’s Will Johnson scores two points for the Wolfpack during the Dr. George P. Moses All-Star Classic at Holy Redeemer High School on Friday. Northwest’s Jaxson Yaple works the ball down court for the Wolfpack. 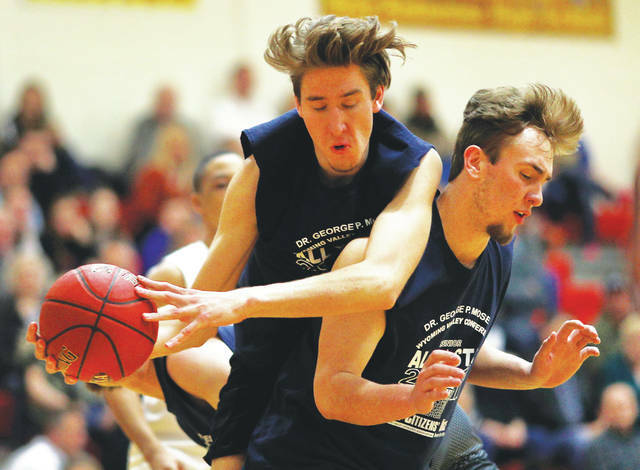 Tunkhannock’s Avery Billings grabs a rebound over the top of his Beggs/Lunger teammate Trahjan Krupinski, of Nanticoke Area. Wyoming Area’s Dan Wiedl, playing for the Beggs/Lunger team, has the ball knocked away by the Wolfpack’s Keegan Brewster, of Meyers, during the Dr. George P. Moses All-Star Classic at Holy Redeemer High School on Friday. WILKES-BARRE – Team Healey began the night simply playing for fun, following the encouragement of coach Kathy Healey from Pittston Area to each try something they did not get to do in their own high school games. 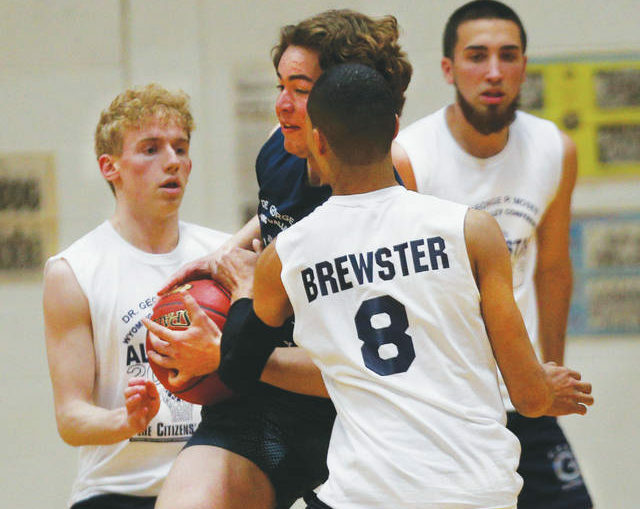 When Team Wolfpack took a pair of 10-point leads early in the second quarter Friday night, basic competitive instincts changed that approach for some players. Virginia Yurchak from Hazleton Area brought Team Healey back then Abby Ritz from Tunkhannock relied on her usual style of play to get the team through the second half. Yurchak finished with a team-high 12 points while Ritz scored all 10 of her points in the second half to rally Healey past the Wolfpack 74-68 in the girls opener to the 50th annual Dr. George P. Moses Senior All-Star Classic at Holy Redeemer High School. “I really just played my game,” said Ritz, who started at point guard for Tunkhannock the past two seasons, including the team’s rise to the .500 mark in her senior season. “ … I didn’t shoot many jump shots. After a quiet first half, she did so effectively Friday night. Ritz went 5-for-8 from the floor in the second half. Ritz played on the team led by the Pittston Area coaching staff and including players from Pittston Area, Tunkhannock, Hazleton Area, Crestwood, Wyoming Valley West, Holy Redeemer, Hanover Area and Dallas. Coaches from the three teams that are being combined into the Wilkes-Barre Area Wolfpack next season led the Wolfpack. 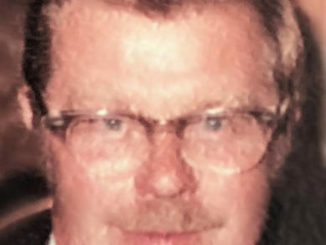 Phil Schoener, who finished the final season leading Coughlin, ran the team with assistance from GAR’s Hattie Carruso and Meyers’ Mary Mushock. In addition to the Wilkes-Barre schools, the team also consisted of players from Northwest, Nanticoke, Wyoming Area, Lake-Lehman and Berwick. Northwest’s Brenna Babcock, who scored a game-high 14 points, was the Wolfpack MVP. Yurchak, who had nine of her points in the first half, got support from Pittston Area’s Emily O’Brien and Wyoming Valley West’s Nicole Boutanos in creating the second-quarter comeback. Boutanos hit a 3-pointer the first time the Wolfpack went up by 10. O’Brien did the same the next time, then followed it up with one of her team-high three blocked shots. The O’Brien 3-pointer started a streak of 11 straight points, ending in Yurchak’s putback with 1:50 left in the half for a 25-24 lead. Yurchak put the team ahead again with a 3-pointer and Team Healey made it to the break with a 29-25 lead. The teams were tied five times and traded the lead nine times until Boutanos scored in the lane with 2:08 left in the third quarter to put Team Healey ahead to stay. Boutanos finished with nine points. Ritz and Samantha Kern from Dallas each had six points in the third quarter. Kern finished with eight points and a game-high eight rebounds. Julia Andrejko from Holy Redeemer had a game-high five assists for Team Healey. She beat GAR’s Olivia Prato 7-6 in the finals of the 3-point contest at halftime. Andrejko’s only basket of the game was also a 3-pointer and it came at a key time. Teammate Sarah Kuderka hit a 3-pointer for the previous Team Healey basket, then made a steal and fed Andrejko, who pulled up in transition for a 71-66 lead with 2:08 left. Babcock was 7-for-8 before missing a halfcourt shot to end the game. She also shared team leads with five rebounds, three assists and two steals. Lake-Lehman’s Madison Borum scored eight points, grabbed four offensive rebounds and blocked three shots. She made her last three shots in the fourth quarter. TEAM HEALEY (74) — Andi Blaski 1 0-0 2, Emily O’Brien 1 0-0 3, Nicole Boutanos 4 0-0 9, Krista Maurizi 2 0-0 4, Virginia Yurchak 5 0-0 12, Riley Magin 0 0-0 0, Sarah Kuderka 1 2-2 5, Julia Andrejko 1 0-0 3, Annaliese Verbeek 1 2-2 5, Bella Termini 0 2-2 2, Sara Whitesell 0 0-0 0, Diane Garnett 4 0-0 9, Abby Ritz 5 0-1 10, Samantha Kern 4 0-0 8, Rebecca Avery 1 0-0 2. Totals 30 6-7 74. WOLFPACK (68) — Brenna Babcock 7 0-0 14, Olivia Prato 1 0-0 3, Bella Skaff 1 3-4 5, Savannah Purdy 3 0-0 7, Madison Borum 4 0-0 8, Ajalaya Butts 2 0-0 4, Trista Babcock 0 0-0 0, Alyssa Lewis 1 0-0 2, Aleah Kranson 0 0-0 0, Ashley Bruno 3 0-0 7, Amiah Lukowski 1 0-0 3, Corinna Scoblick 1 0-0 2, Da’Nayia Ballard 1 0-0 2, Megan Dalo 1 0-0 2, Jilann Baron 3 0-0 7, Bella Czeck 1 0-0 2. Totals 30 3-4 68. Three-point goals — TH 8 (Yurchak 2, O’Brien, Boutanos, Kuderka, Andrejko, Verbeek, Garnett), WP 5 (Prato, Purdy, Bruno, Lukowski, Baron). 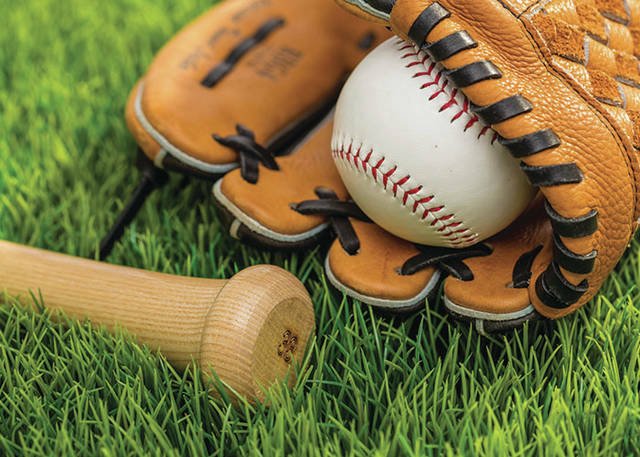 KINGSTON — It’s the opening week of the season for divisional play in the Wyoming Valley Conference baseball league. Division 3 is expected to be very competitive. If it turns out to be anything like the opener between Holy Redeemer and Wyoming Seminary on Wednesday, it’s going to be very fun to follow. The Royals came from behind early, then held off a valiant comeback effort from the Blue Knights to hang on for a 5-3 win at Nesbitt Stadium. Trailing 5-1 to start the bottom of the seventh, there was no quit in the Blue Knights. After the first out was recorded, the next three batters reached base, including an RBI-single by Aiden Murphy (3-for-3, two RBI). One batter later, Jackson Amend singled in a run to close the gap to 5-3. The runners moved up to second and third before Redeemer hurler Brett Kugler got Charlie Kutz to bounce out to end the game. Sem started the scoring in the bottom of the first going up 1-0 on a run-scoring single by Murphy, who was also the starting pitcher. But after a slow start against the strong Murphy, the Royals got their offense going in the third inning. That’s when Collin Cook (2-for-2, two runs scored, two RBI) drove in a run on a single after one scored on a groundout for a 2-1 lead. Cook generated offense again in the fifth. This time, he doubled in Dalton Preston for a 3-1 advantage before stealing third and scoring when the ball got away from the third baseman for a 4-1 lead. Meanwhile, Wickiser was getting big outs when he needed it. In addition to striking out six Blue Knights in 5 1/3 innings, he helped strand six runners on base. In the second, he got the last two outs to leave a runner on second. In the third, Sem had runners on second and third with one out, and loaded the bases with two outs before they were left on. 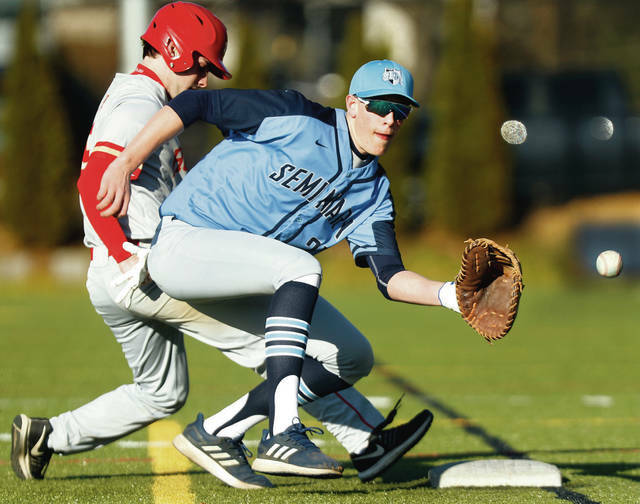 The Blue Knights also stranded a runner on third in the fourth and one on second in the fifth as Wickiser pitched in his third outing this season — his longest. “I was feeling a groove with my slider, my offspeed and I was catching them out front a lot. 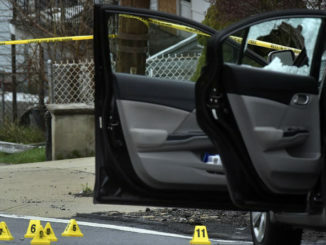 Everything was working today,” Wickiser said. Murphy was stellar on the mound despite allowing two runs in four innings. He fanned six leaning on an overpowering fastball and walked just one. “We saw him last year and expected nothing but very good stuff from him this year,” Ritsick said about Murphy’s arsenal on Wednesday. Sem had 10 wins in the division last season, while the Royals had eight, but Wickiser hopes Wednesday’s win made a statement. The teams will meet again on April 25 at Hollenback Park. The Trojans jumped out to a 6-0 lead in the second inning of a win at PNC Field. They got hits from seven different players, led by two from Derek Cease. Jake Krupinksi hit an RBI triple while Colby Butczynski struck out six for the win. Freddie Lombardo doubled and drove in two runs for the Mountaineers. Hanover Area rode a nine-run second inning to a four-inning victory over the Grenadiers. Connor Hummer picked up the victory, going three innings and allowing just one hit and one run while walking one and striking out four. Meyers used a seven-run seventh inning to pull away for the victory. Blake Bynon knocked in two runs for Meyers. Jacob Ostrowski had two of the Mohawks’ six hits. Dave Piestrak was 2-for-3 for Northwest. 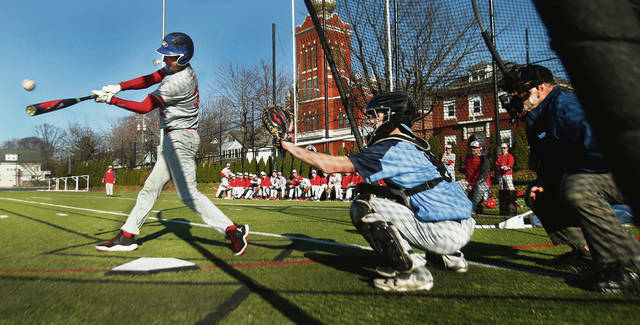 Holy Redeemer batter Collin Cook hits the ball deep to the outfield in the fifth inning with Wyoming Seminary’s Jackson Amend behind the plate Wednesday in Kingston. Holy Redeemer first baseman Frankie Desiderio brings in a throw to put out Wyoming Seminary’s Kyle Hromisin. David Wickiser pitched into the sixth inning for Holy Redeemer, striking out six while picking up the win on Wednesday. 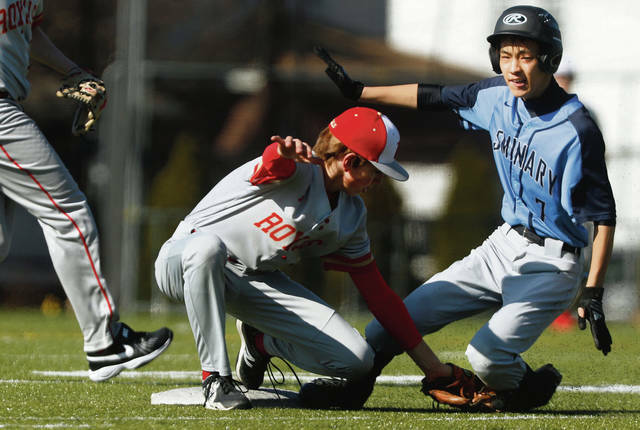 Holy Redeemer’s Ryan Williams beats the throw back to first base in front of Wyoming Seminary’s Aiden Murphy. Holy Redeemer’s Dalton Preston tags out Wyoming Seminary’s Hugo Kachi as he slides into second base in the second inning Wednesday in Kingston. 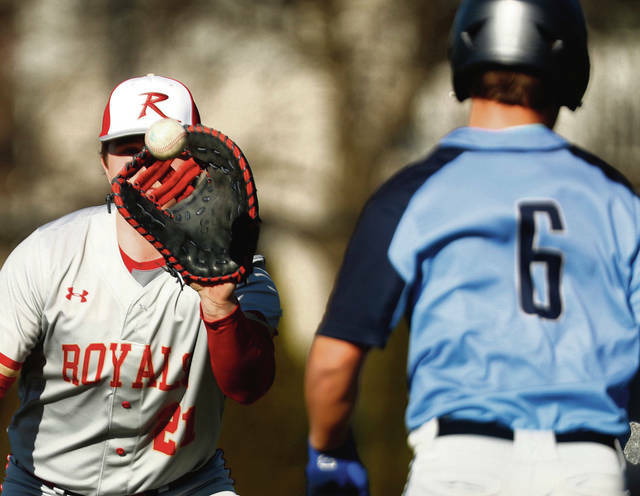 Holy Redeemer’s Collin Cook crosses home plate in the seventh inning for a helpful insurance run for the Royals prior to a Wyoming Seminary rally. Tyler Faux knocked in two runs and Tunkhannock held off a seventh-inning rally by Berwick for a 3-2 victory Tuesday in a Wyoming Valley Conference Division 2 baseball game. Shane Sherwood pitched five innings to get the win. Nick Reposa recorded the final out for the save. Shane Levan and Max Slusser each had an RBI for Berwick in the seventh inning. Cole Cherkas threw a one-hitter and Joe Cencetti knocked in four runs as Pittston Area defeated visiting Crestwood. Cherkas struck out six and walked three in his complete-game victory. He also doubled for Pittston Area’s only extra-base hit. Cencetti finished 3-for-4. Colby Jones doubled for Crestwood’s only hit. Jerome Repetz led Hazleton Area in a five-inning win by going 2-for-2 with three RBI. Gabriel Colyer also contributed two RBI while going 2-for-3. Brady Antolick threw the first three innings, allowing just one hit while striking out six for the Cougars. Wallenpaupack had just three hits, but scored three unearned runs in the second inning and held on to defeat Wyoming Valley West in a non-conference game. 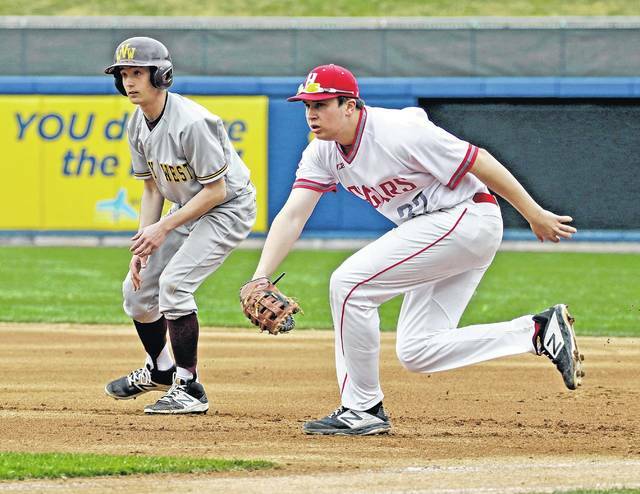 Chris Matello and Ryan Stevens had an RBI each for Valley West. Stephen Banas was 2-for-2. Lake-Lehman earned a 25-20, 25-23, 25-13 sweep. Sean Sabaluski had six kills and 18 digs for the Black Knights while Justin Timonte added six kills and six blocks. Jay Martin led the team with 17 service points. The Tigers fell to Delaware Valley in three sets 25-10, 25-19, 25-15. Tom Raniero led Delaware Valley with 37 assists, 10 service points and three aces. Blake Gearharo added 21 kills, seven service points and two aces. Paul Binner led Tunkhannock with four blocks, five kills and 10 assists. Trejon Turner and Avery Billings each added three blocks while Turner had five kills and Billings had seven. The Blue Knights a four-point game from Paige Parsons, who scored three goals along with Ashley Metz. Christina Kilyabek, Grace Parsons and Margaret Mihalek each added three points apiece as well for Wyoming Seminary. Mara Adams scored the Tigers’ lone goal. Ali Tedik scored the lone goal for the Crusaders, who got 14 saves from Raven Bozak. Kerry McGrath had a hat trick for Scranton Prep to lead the team in goals while Lillian Boles and Christina DeNaples each added two goals. Aiden Sekely made 11 saves for the Classics. Meyers pulled out a close meet by finishing in the top two in each of the triple jump, shot put, pole vault, long jump, javelin and high jump. Brandon Reno finished 4-for-4 with three doubles, a home run and four RBI to carry the Colonels to victory. Michael Patrizio finished 2-for-3 with two runs scored. Jack Fischer, Bryan Nifenecker and Nick Malatesta each added two RBI. Tony Molitoris went 5.1 innings allowing just five hits and two earned runs with two strikeouts to record his first collegiate victory on the mound. King’s junior Jonathan Hoyt had a career high three hits in four at-bats in a non-conference loss. The Monarchs were able to get men on base each inning recording 11 hits and drawing five walks but struggled to drive in runs leaving 13 men on base. Sean McKee and Tyler Reynolds added two hits for the Monarchs while Matt Dobeck and Kyle Friebolin had a hit and an RBI each.